Musicaklassen Extra: a glimpse of an educational future? For two richly filled days, with participants from Belgium, the UK, the Netherlands, Germany, Switzerland and Portugal, Musica hosted the symposium Musicaklassen Extra: a glimpse of an educational future? 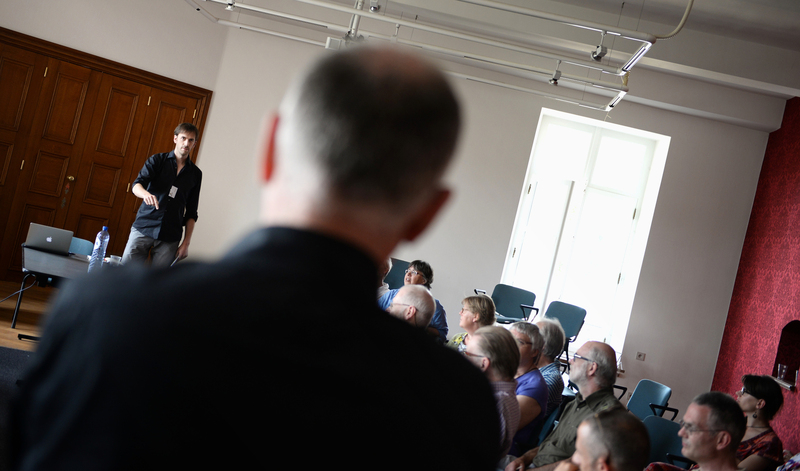 With a week of real Musicaklassen in the background, the diverse group of participants were introduced to Musica’s ideas about music education, divided into four topics: listening, communicating, embodying and ‘musical thinking’. The aim was to subject our own approach to the critical gaze of specialists from Belgium and abroad. How do we look at musical development and why do we believe it is important? Which approaches are the most relevant? 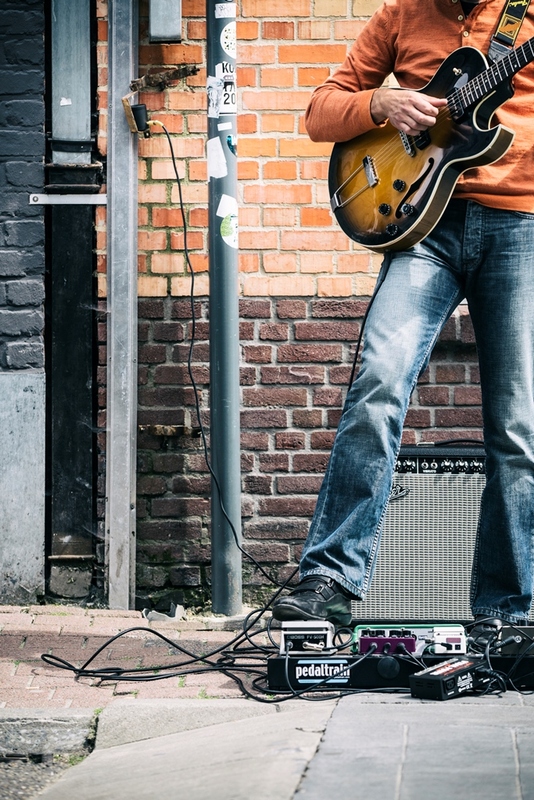 How do we deal with the widespread lack of active musical experiences among participants? What role can or should tradition play in this? Why is music so important in the curriculum and how can we stimulate music education? Various participants gave presentations of their own, which often provided interesting links with Musica’s work and references to inspiring contexts. A discussion of the film Alphabet by Erwin Wagenhofer (2013) – which was quite provocative – led to intense exchanges. How do we balance structure and freedom, tradition and innovation? What does science have to say about these dichotomies? What models can we offer as support, and why? What role does the artistic play in all this, and what significance do we grant it? As the keynote speaker, Lode Vermeersch of the HIVA Research Institute for Work and Society at the KU Leuven presented his vision of the formation of theories on cultural education based on research connected to Barend Van Heusden’s Cultuur in de Spiegel. It was a challenging topic, all the more so because many participants believed that the ‘time-based’ art forms (particularly music and dance, but to an extent drama and multimedia as well) do not really fit into the model all that well. This was a fundamental debate that will hopefully be continued! 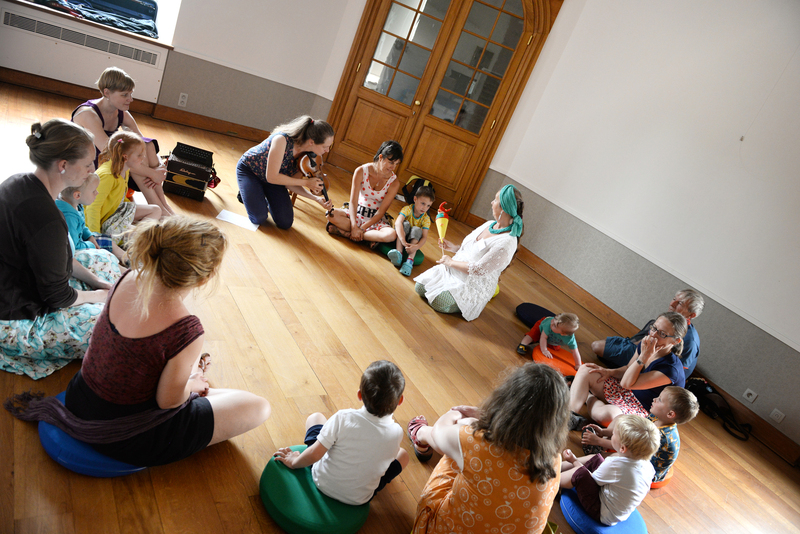 The general conclusion was that the development of musical imagination and the creation of one’s own music must not be the icing on the cake, but must constitute the epicentre of every form of musical education, from the very earliest beginnings. On Sunday 18th October, Musica celebrated the tenth anniversary of Klankenbos. 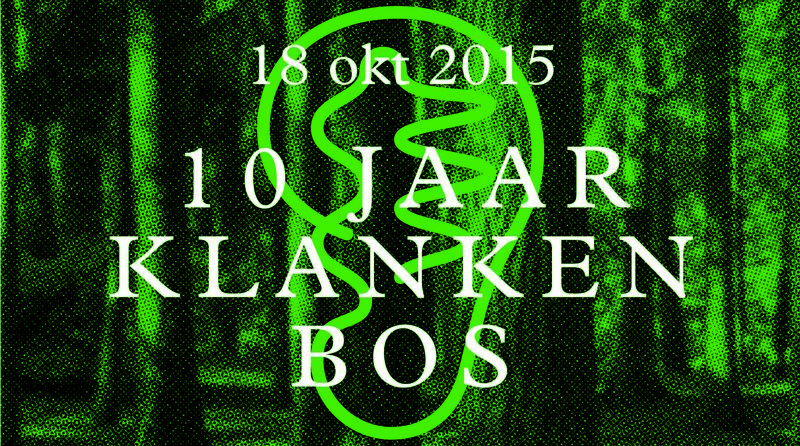 After a decade of creating art in the open air, Klankenbos still defies categorisation in the world of sound art. There is no other collection like it in Europe. It is true that contemporary art museums are paying more attention to sound art today than they used to, but often only to a limited extent and within the confines of their four walls. Neither do the many sound art exhibitions and festivals in our region offer a permanent collection with free admission like Musica’s Klankenbos. 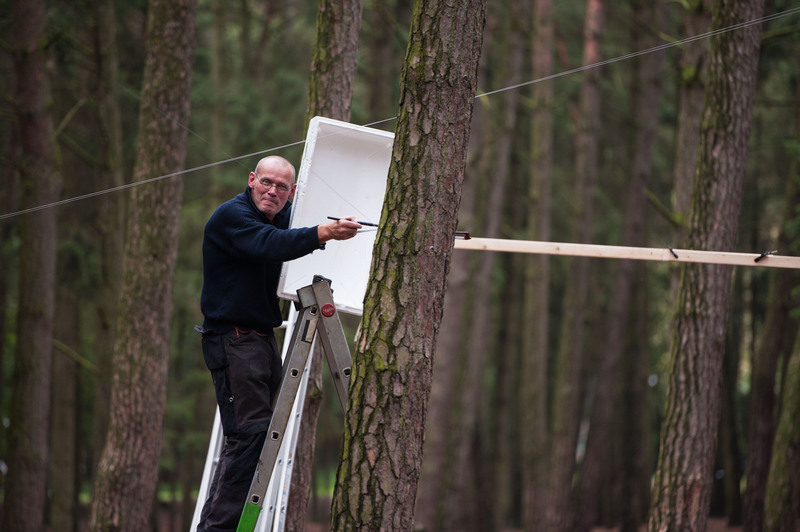 Among the trees of the Provinciaal Domein Dommelhof in Neerpelt are sixteen unique and extremely diverse pieces of sound art by Belgian and – especially – foreign artists, in relatively quiet surroundings. So we have every reason to celebrate. 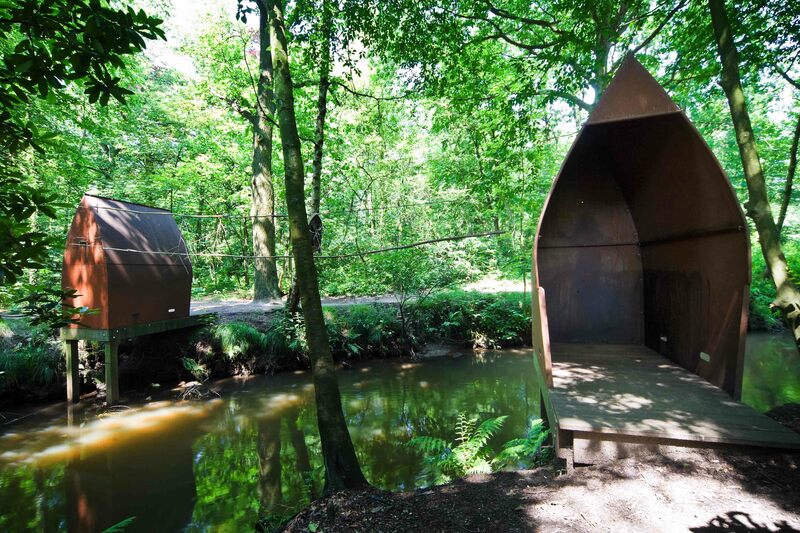 The sound installations in Klankenbos are not works of art that have been purchased, but unique creations developed for a specific location in the woods, designed in harmony with nature and the acoustic environment. This interaction has resulted in the sound artists and other artists building up a close relationship with the site. 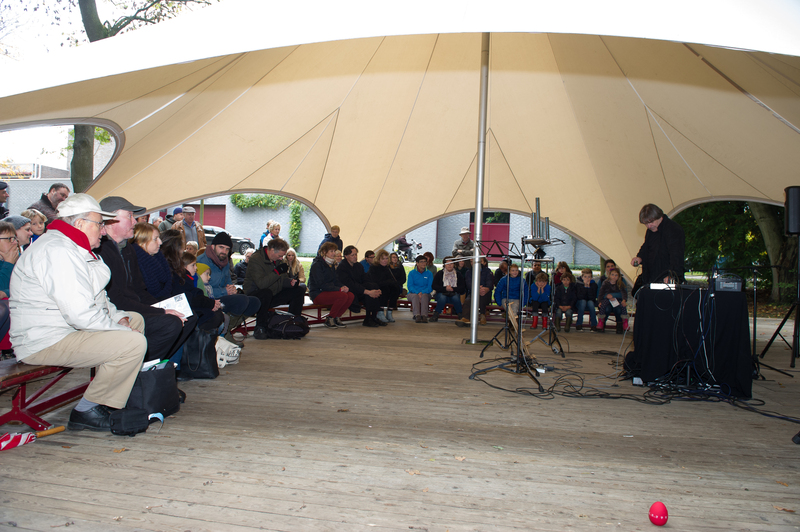 So they responded enthusiastically to the invitation to come back to Neerpelt on 18th October for an afternoon of sound art, music, poetry and quiet in the open air. 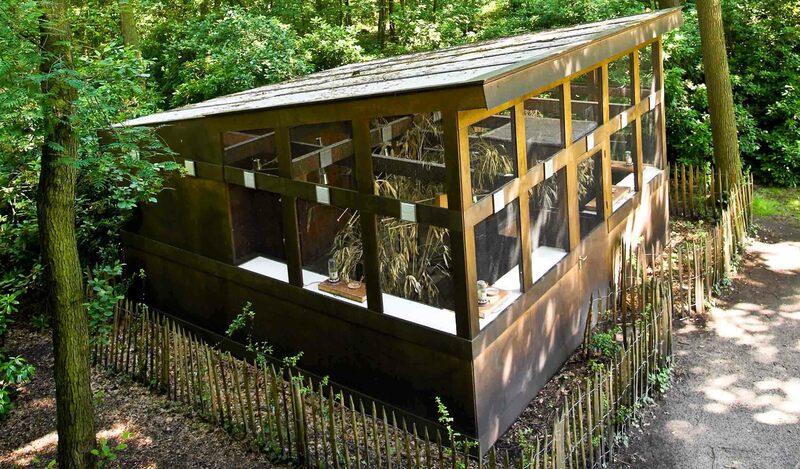 Paul Panhuysen’s Kanariestudio and Pierre Berthet’s Houses of Sound date back to 2005, making them the oldest installations in Klankenbos. The artists also got the chance to show off their other talents besides making sound installations: some of them have a background as a musician or performer as well. It was exciting to watch live performances by Erwin Stache (Konversation), Rozalie Hirs (Curvices) and Tony di Napoli (Chaise Résonnante) at various locations in Klankenbos. In a series of short live acts, Erwin Stache showed that humour and electronic music make an excellent combination. Pressing his face between sensory iron rods or playing with beeping and crunching noises, Stache captivated listeners of all ages without compromising his artistry. On the same stage, the composer and poet Rozalie Hirs balanced on the vague border between sound and poetry with a mixture of electronic soundscapes and spoken texts. Her performance corresponded closely to the presentation of her poetry collection Het laat zich niet vangen (published by Uitgeverij P), with ten texts pondering the relationship between humans, sound and environment. 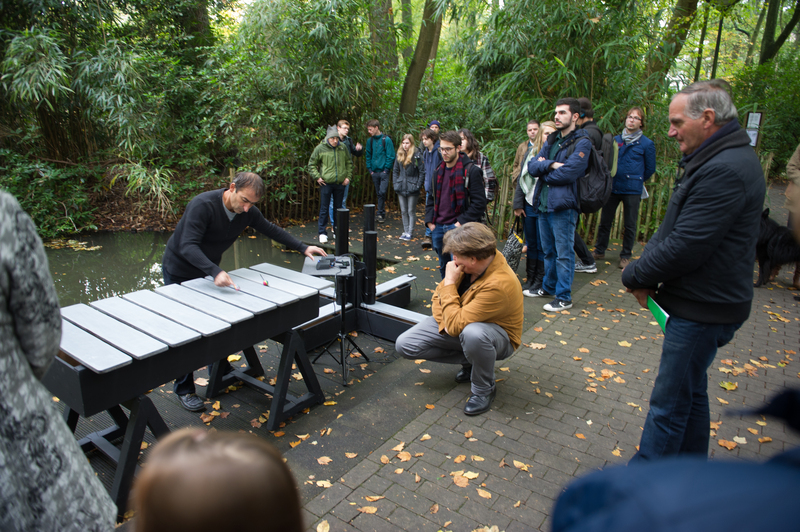 A little further away, Tony di Napoli translated the principle behind his installation Chaise Résonnante into a live performance: he produced sound out of stones using resonators, subtly filling the banks of the Dommel with humming microtonal frequencies. Peter Jacquemyn treated us to a repeat performance of his Long String(s), which was on the programme for Samhain 2012, on the Finnish trail. All afternoon, these live interventions mingled with the subtle sound environment of the permanent collection. That collection was highlighted even more during 10 Years of Klankenbos with free tours for visitors of all ages. As is so often the case at Musica, we paid special attention to young creators. 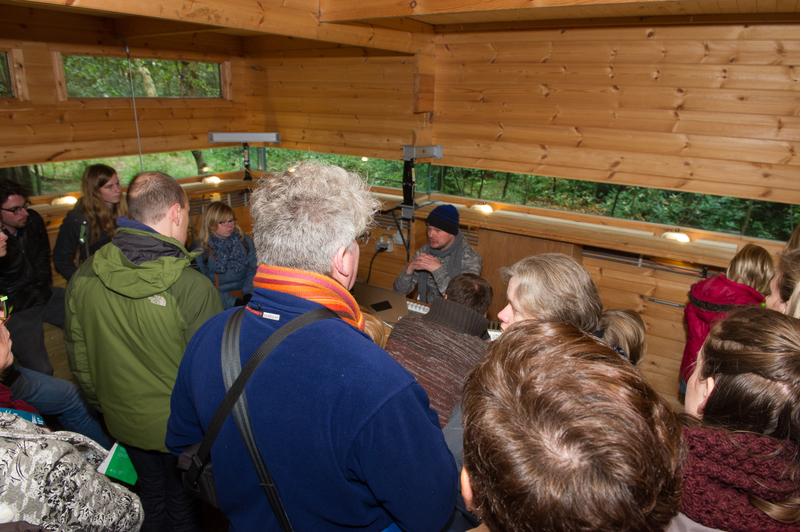 Klankenbos resident Stijn Demeulenaere created a customised soundscape for the wood in Radio Forest, which he performed with live processing on two occasions for the listeners who had gathered around him in the hut. 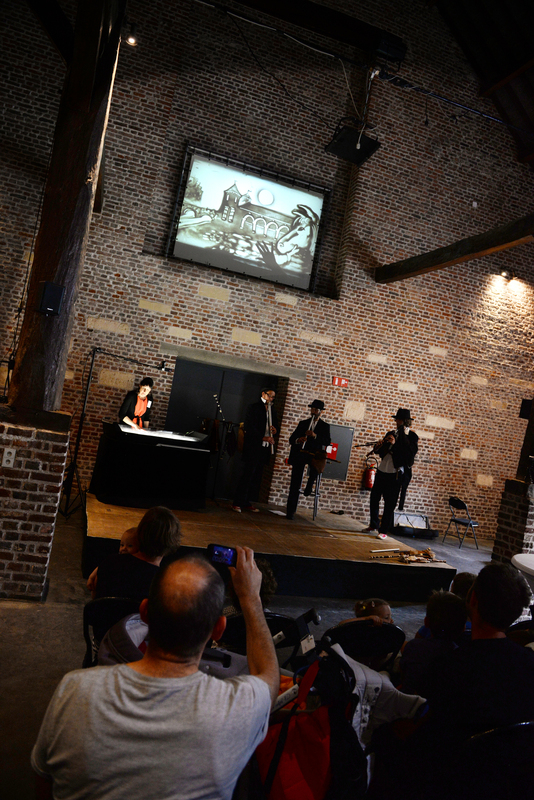 Indoors, in Dommelhof Theatre, visitors got a sneak preview of the multiplayer game environment Attr-X by Yvan Vander Sanden, who has developed several interactive applications for Musica in the past. This first-person game (work in progress) allows players to experiment with all kinds of sound-producing objects and crazy sound effects. Five participants in Musica’s international composition course SoundMine also took to the stage at 10 Years of Klankenbos: Umut Eldem, Liesbet Decrock, Carlos Brito Dias, Cem Özcelik and Cyriel de Clippel. These promising composers had the chance to compose a piece this year for the famous Logos Foundation robot orchestra. 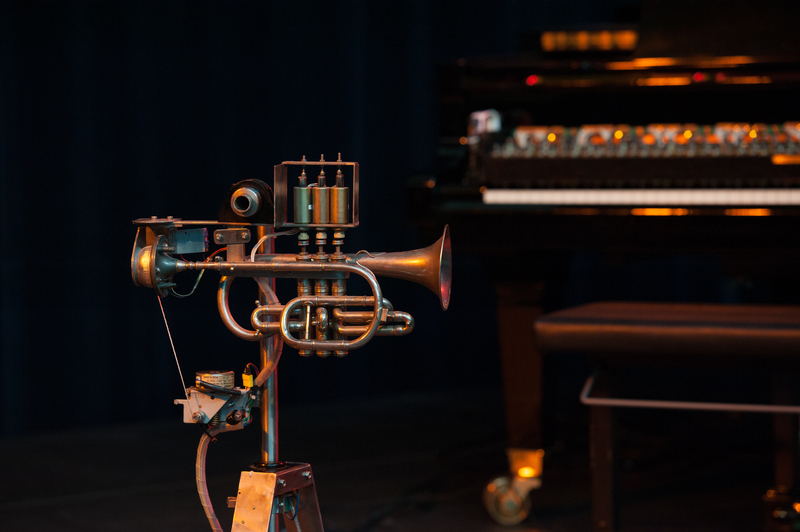 The results of the process were performed live by a mechanical piano, cornet and snare drum. As for young children and toddlers: they could have the time of their lives in the shower of hearts that made up the children’s installation LOVE SONG KLANKENBOS that was created in Klankenbos over the summer. 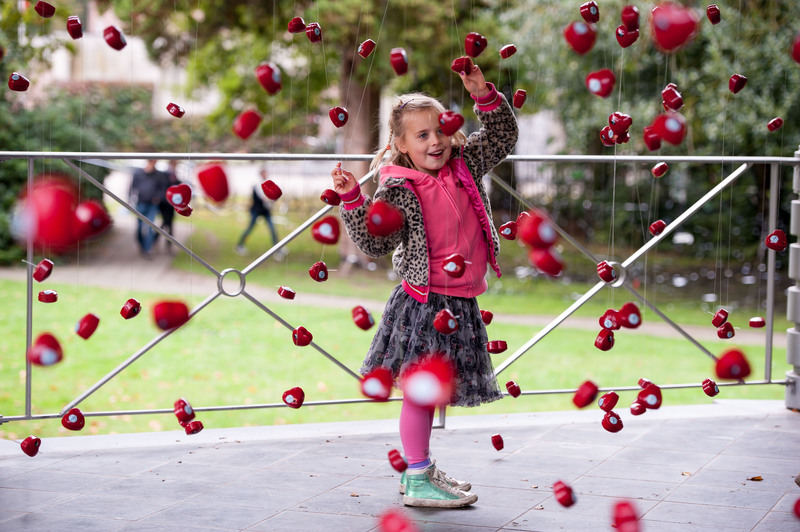 During a sound treasure hunt, almost a thousand children from all over Flanders contributed a heart with their unique sound to this artwork, which was made as part of the Schatten van Vlieg campaign (with Cultuurnet and ChampdAction). During the official closing event at 10 Years of Klankenbos, Musica’s director, Paul Craenen, emphasised that Klankenbos is not a static exhibition but a constantly evolving laboratory where amateurs and professionals can experiment with sound. 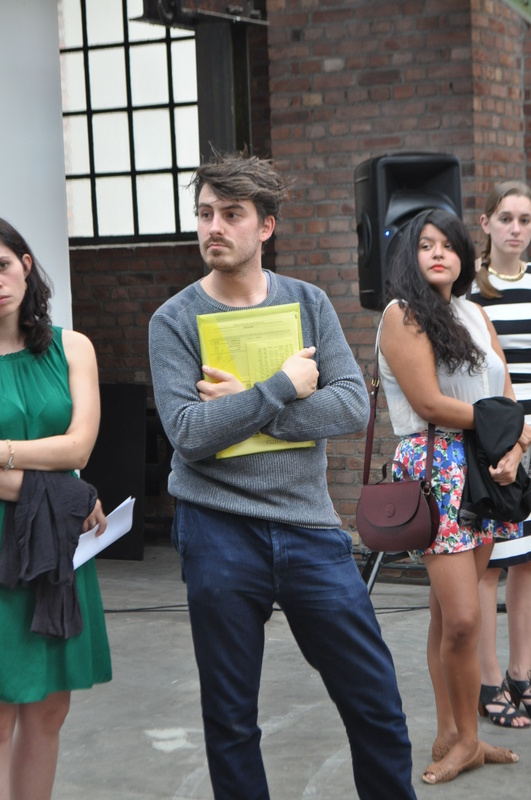 That was also reflected in the programme, with the presentation of no less than four new installations. 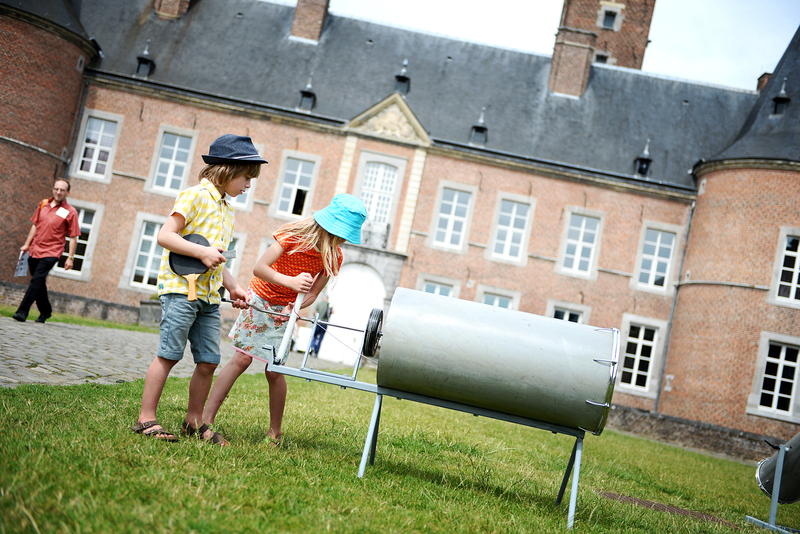 Two of the new installations are mobile, in the sense that they are not really a fixed part of the Klankenbos collection but can be set up during external festivals and events. One is a monumental PVC instrument created by the Logos Foundation that allows children, parents and musicians to make music together, and the other is a new version (in fact the third) of the Self-Simulator. The latter is a wearable art work based on a concept by Simon Steen-Andersen. 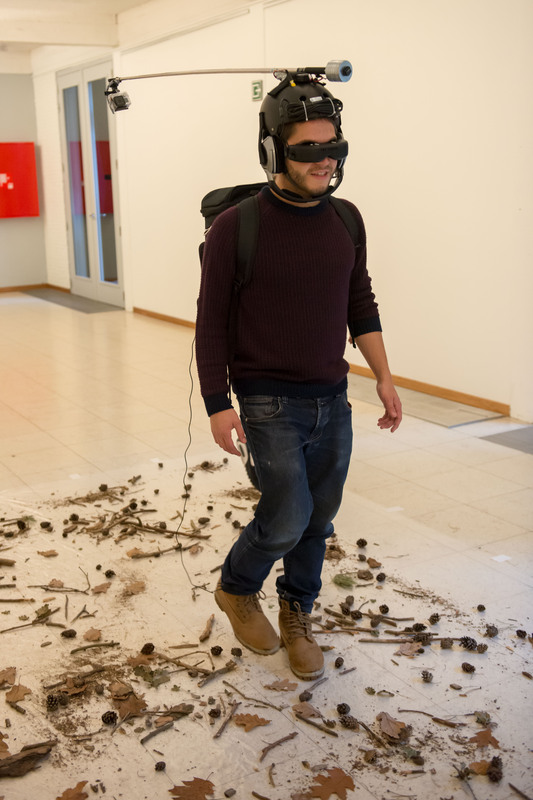 Bart van Dongen’s virtual listening walk has also been added to the Klankenbos collection. This interactive sound walk is part of the World War One Sound Route and can be experienced using a GPS-based app. 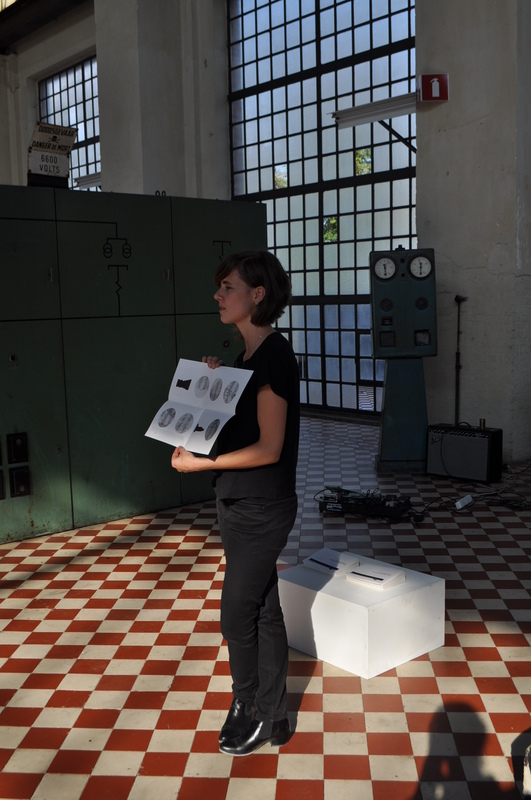 As the icing on the cake, Musica presented a brand new physical installation by the Belgian sound artist Laura Maes. In collaboration with the Logos Foundation, she created a musical toy for the open-air playground Scoutsrally beside Klankenbos. This allows Klankenbos to go literally beyond its own borders. Liglicht is a public bench that reacts to light. By covering part of the surface, the intensity of the light is reduced, influencing the patterns of sound. Looking forward to 20 years of Klankenbos? The Klankenbos adventure is far from over. Musica is planning many more activities in 2016 based on musical discovery and participation in and around Klankenbos. An important aspect of this is the residency programme. In the spring, students from the RITCS in Brussels will come to Klankenbos for inspiration and young artists from the Dutch sound collective Soundlings will take their turn in the autumn. We are also looking forward to an updated range of activities for various target groups in the spring, and the national meeting of the Federation of Tourist Guide Associations in the summer. Last but not least, Musica and Dommelhof are organising an event around transdisciplinary art, with the focus on sound. Be sure to note Saturday 22 October 2016 in your diary! 10 years of Klankenbos was organised by Musica, Impulse Centre for Music in partnership with Provinciaal Domein Dommelhof, Gonzo Circus, UiTmetVlieg.be, the town of Neerpelt, Kunstacademie Noord-Limburg, PNEM Sound Art Festival and BesteBuren. The second edition of AlbaNova continued the momentum of the previous year, as a one-day festival where early and contemporary music play alongside each other and intermingle, with considerable emphasis on participation and interaction between the artists and audience. The theme of the festival highlighted these aspects particularly clearly. 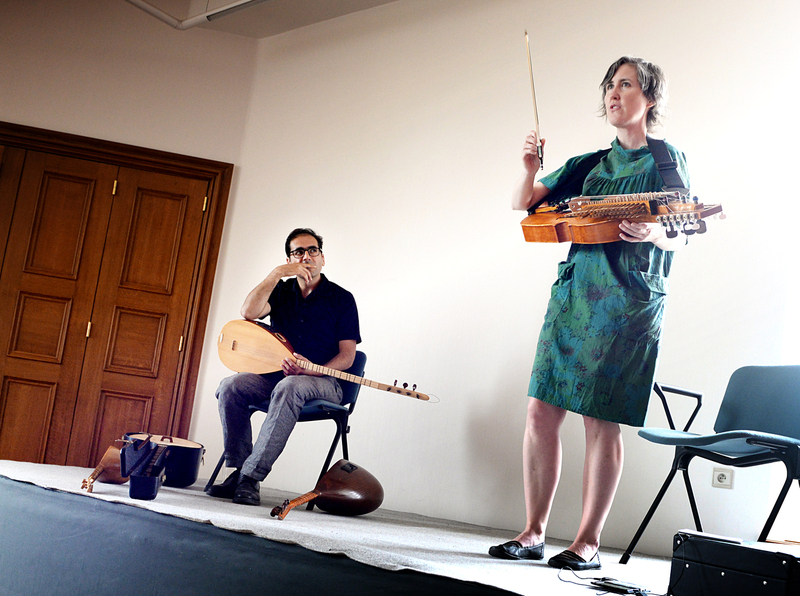 Under the name EDEN, which referred to the annual mediaeval gatherings of musicians from all over Europe in cities in the Low Countries, viol and vielle player Thomas Baeté brought together a collective of musicians from diverse backgrounds. They performed a greatly appreciated opening concert with a sample of what the audience could expect later in the day: a wide range of voices and languages, musical encounters and ever-changing combinations of musicians. 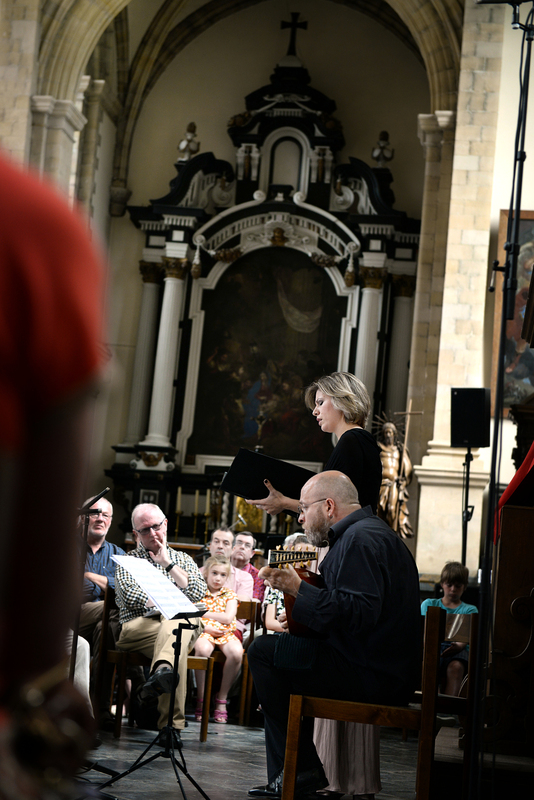 One by one, the singers appeared from different corners of the church, singing and playing, coming together in a sonorous, contemporary ‘école du nord’. 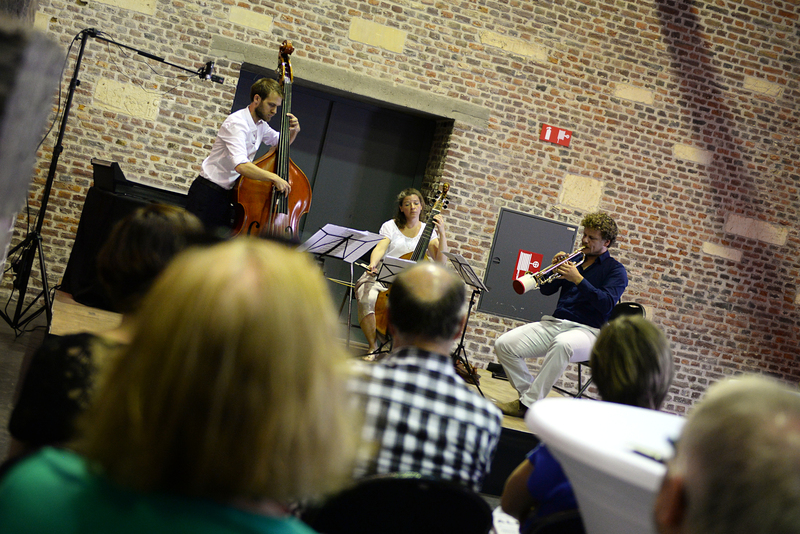 After this concert, the musicians spread out across the site in smaller formations: duos and trios performing historical music, music from oral traditions and new creations at various locations in Alden Biesen. 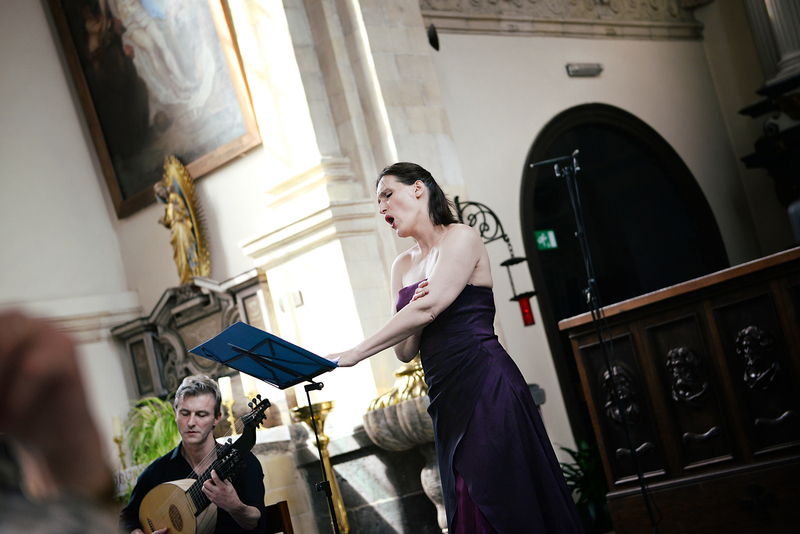 Soprano Olalla Aleman and lute player Jan Van Outryve evoked the visions of the mystic Saint Teresa, a celestial Scheherazade from the Golden Age of Spain. Love songs from two far-flung corners of Europe found each other in singing voices and buzzing strings. Balkan rhythms, Scandinavian ballads, ancient estampies and Tuvan throat singing are just a few of the elements that come together in the concert by Osuna. French stars Claire Lefilliâtre & Vincent Dumestre took on the vanitas theme that was so popular in the seventeenth century. Who dares combine Georges Brassens, Sigismondo d’India, Woody Guthrie and Henry Purcell … The Shuffle Season! The beautiful weather helpt to create a vibrant, relaxed festival atmosphere for the numerous open-air concerts, children’s workshops and a monumental PVC installation. The family atmosphere was also a tangible part of performances and acts that attracted people of every age, such as the particularly popular performance by sand artist Colette Dedyn with music by the Griff Trio. Once again, AlbaNova presented great creativity and original perspectives. Thomas Smetryns performed a highly concentrated, hushed concert with his Helmholtz Kwartet, on tuning forks, electronics, violin and cello. 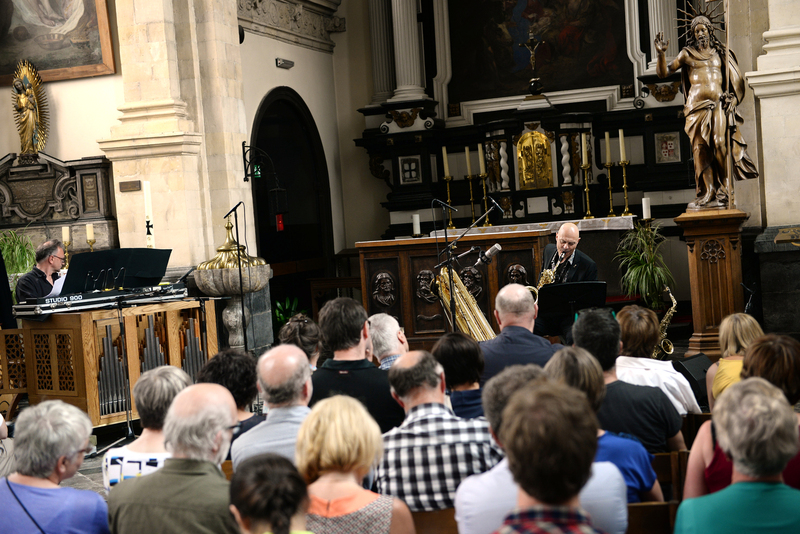 Eric Sleichim and Marnix De Cat searched for shared ground between Renaissance polyphony and the contemporary instruments bass saxophone and electronics: a quest that was clearly still in its infancy. Viol player Romina Lischka and cellist Benjamin Glorieux, in turn, played deeply personal music in the Tiendschuur. Romina performed an acoustic set bridging the gap between jazz and classical music with an unusual combination of viol, double bass and bugle. Benjamin used his cello and a loop station to create a noise-like texture that gradually revealed the contours of a Renaissance piece by Jacobus Vaet, like a genie from a lamp. 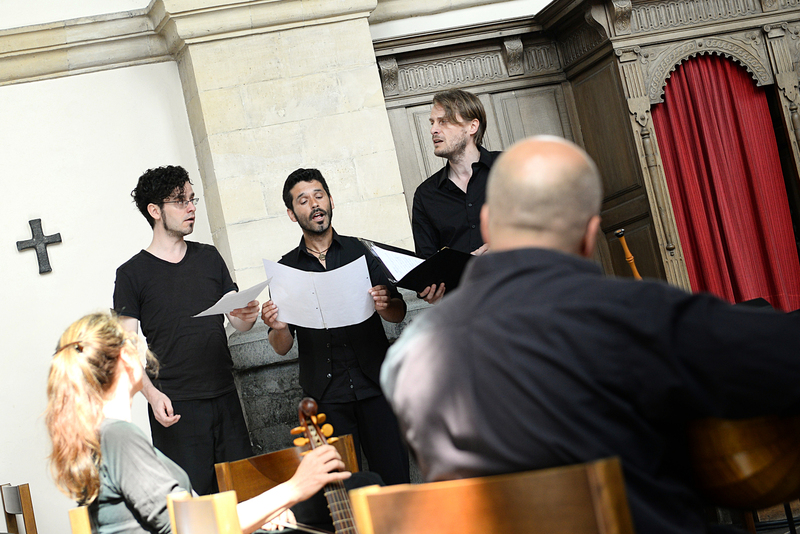 Other refreshing combinations came from Hendrik Vanden Abeele and Pieter Stas, who gave an interested and attentive audience a concise, active introduction to the origins of polyphony. After treating the audience to an active speed-dating session with the Tsgrooten antiphon at the first edition of AlbaNova, Hendrik Vanden Abeele once again tested the borders of a format somewhere between a ‘lecture-performance’ and participatory concert. 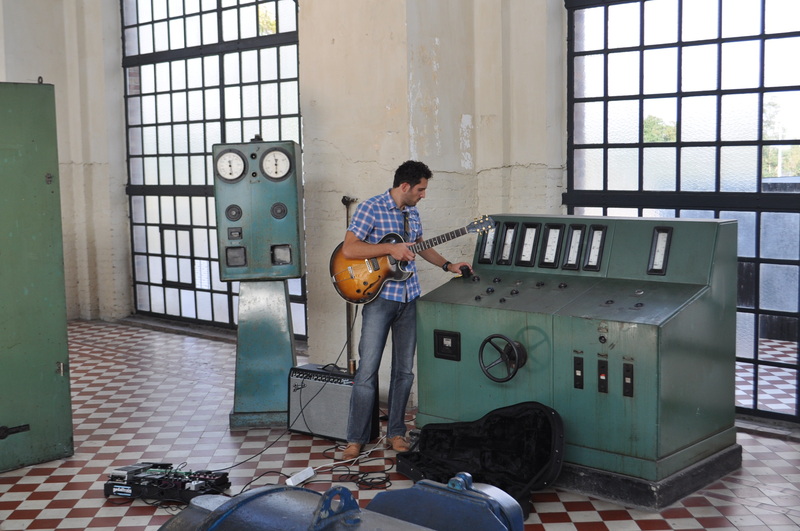 Last but not least was the exciting project by musician and sound artist Michaël Liberg. AlbaNova had commissioned him to create a soundscape of the festival with the help of ‘sound reporters’ in the audience that began at the start of the opening concert and gradually grew into a collective composition. The audience could peep over his shoulder in a pop-up sound workshop, watching how he gradually built up a soundscape of the festival. The result can be heard in the Klankatlas. 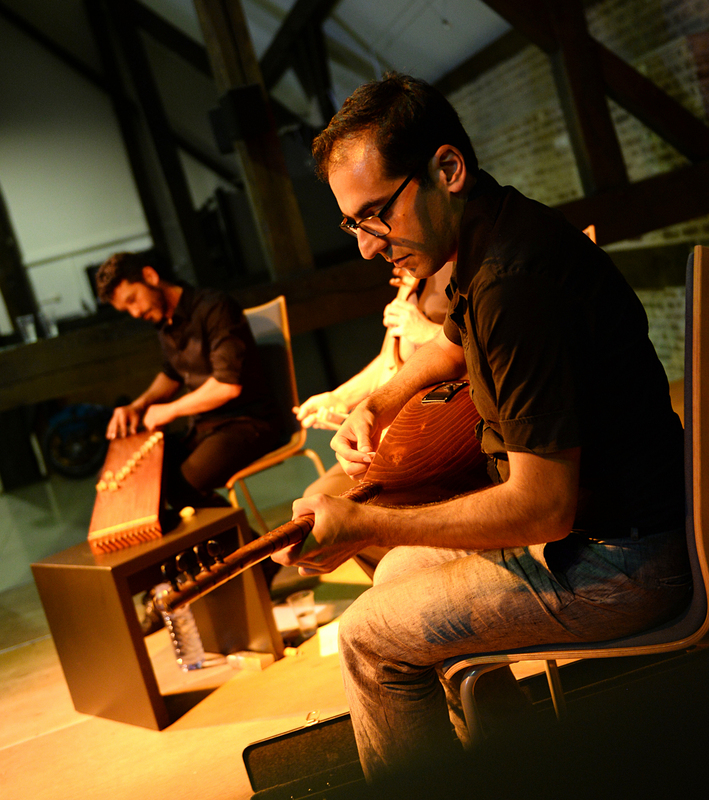 Thus AlbaNova – EDEN achieved its aim of crossing the borders between historic and contemporary music, as a report by Deutschlandfunk put it. The festival has proved that it is capable of giving new impetus to the world of old and new music in a short time, activating the audience beyond the customary codes of a classical concert and creating opportunities for young talent. Relive the festival in the compilation film below. The biannual festival Samhain was held for the second time in Neerpelt in the last weekend of October. 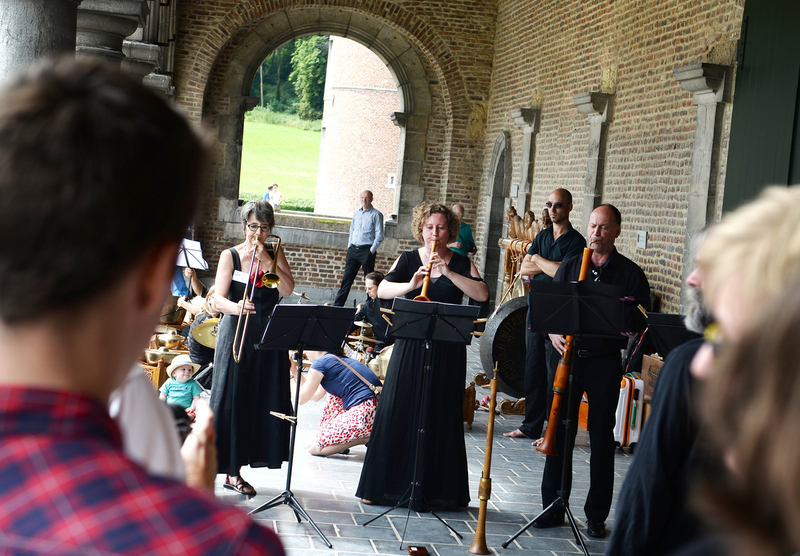 For three days, Musica and the Provinciaal Domein Dommelhof joined forces to create an interdisciplinary event at public and less public places in the Limburg village. For Samhain, the entire village is transformed into a concert hall: performances, sound installations and concerts can be found in the church, empty buildings, the playground, the pub, the woods or simply in the street. Some are announced, others unexpected. Besides the professional artists, local groups and amateurs help to create a fantastic atmosphere for this community art weekend. ‘Co- art’ means art created or partly created by amateur artists, or art that involves a high level of participation from the local community. Community art is certainly nothing new. In past centuries, art and music were often a community affair. Collective creations and interdisciplinary festivities were held in town squares and public spaces: colourful processions wound their way through the streets, Lutheran chorales were sung by entire congregations and folk dances brought three or four generations together. Even today, many traditional societies do not distinguish between ‘high-brow’ and ‘low-brow’ art. 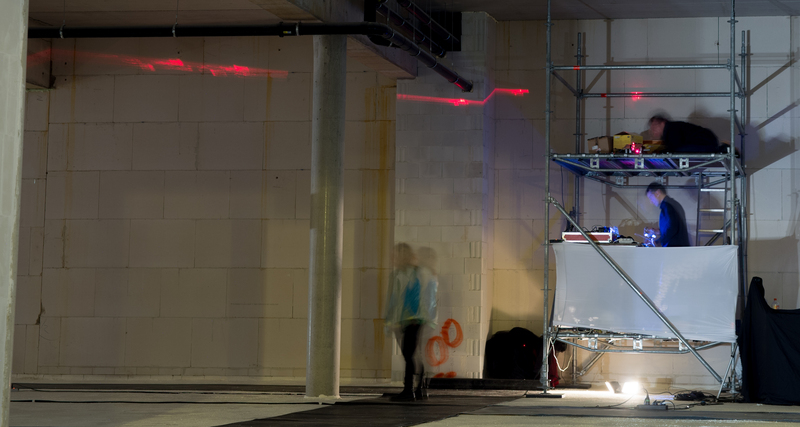 For Samhain, Musica and Dommelhof tune into the public sphere and urban environment again, inviting the entire population of Neerpelt to work with professional artists. 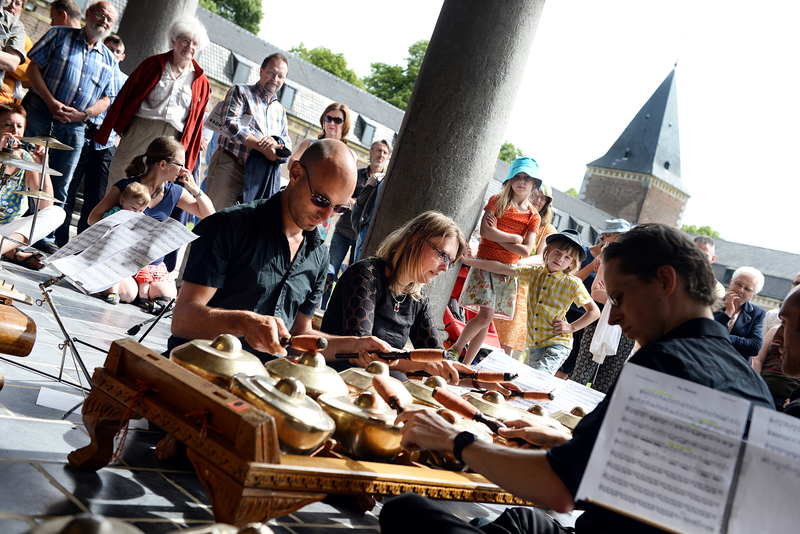 This community aspect was at its best on the Saturday afternoon, during the impressive concert in Neerpelt church. 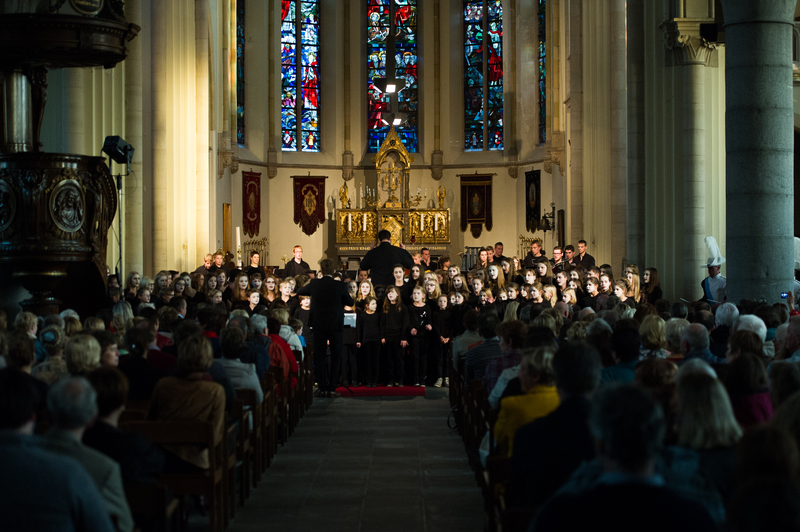 Almost 200 amateur musicians from five local groups came together to create one big orchestra: De Piccolo’s children and young people’s choir, the North Limburg Academy (NIKO) concert band and percussion ensemble, the Gregorian choir from Achel and the Cadence drummers from Kaulille. Four generations under one roof. Never before have so many musicians from the Neerpelt area come together in a single orchestra. They performed a work composed especially for the occasion by Michiel De Malsche. About six months ago, this talented composer from Sint-Niklaas was commissioned to write a piece for local ensembles who would sign up to play it. 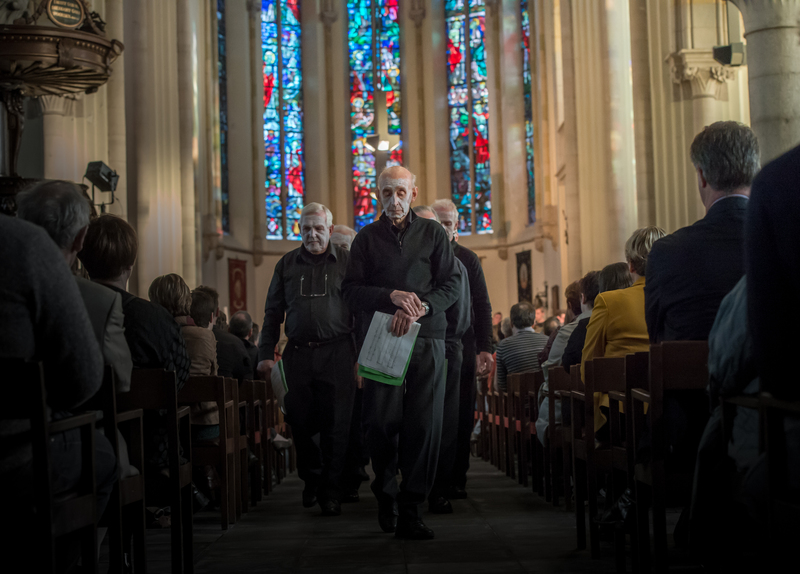 The result, with the same name as the festival, was an exuberant mass for the dead in which De Malsche makes fine use of the church’s spatial potential. 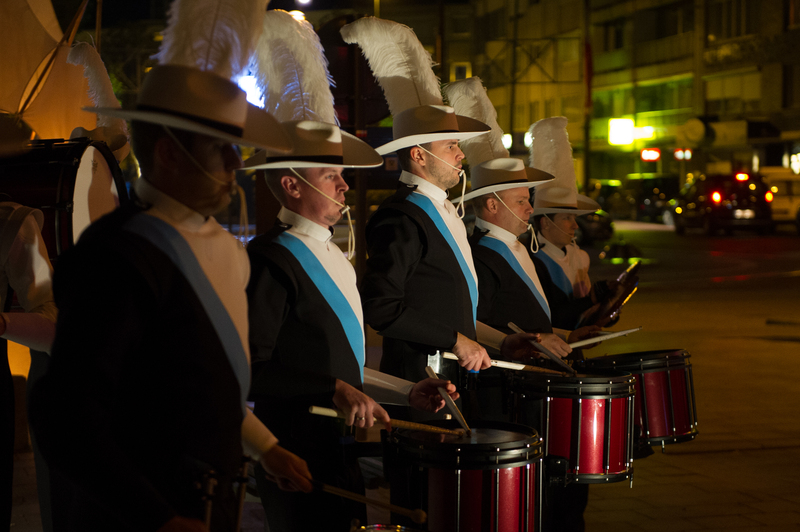 The show in the church was preceded by a deafening parade by Cadence Drumline outside on the Marktplein. Obviously you did not have to buy a ticket to see the drummers at work outdoors. Many coincidental passers-by who would not necessarily come to the concert in the church or had not even heard of the festival, stopped to listen. The borderline blurred between visitors and passers-by; the village square became a stage for unexpected performances by musicians who filled the streets with music. An event like Samhain needs more than just existing productions and formats on the programme. 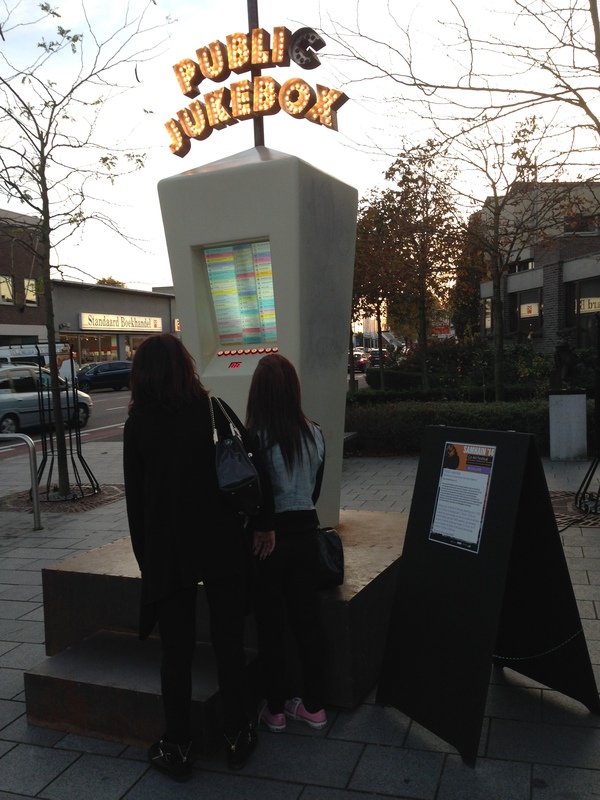 However there were travelling international sound installations involved, such as The Speakers by British collective Aswarm and the Public Juke Box by the Czech artist Kristof Kintera, but both of these were given local input relevant to the festival. Nevertheless, most of the projects at Samhain were new creations requiring a different approach. These often arose from unusual new partnerships. A good example is KIDSCAM, for which primary school pupils went to visit a home for elderly people with the composer Thomas Smetryns. The children used the results of these inspiration sessions to make a musical animation film with professional coaching. The Belgian-Dutch sound art duo Donia Jourabchi and Taufan Ter Weel were also inspired by the local surroundings to create their installation All That is Solid. 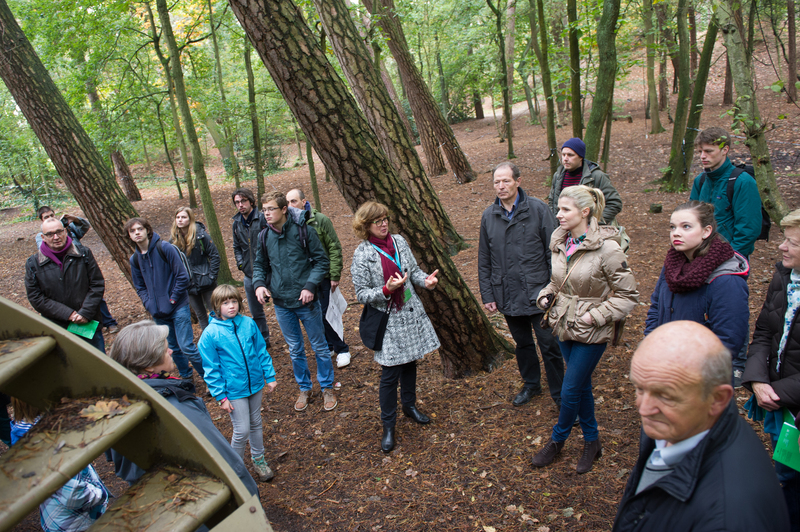 They took two groups of children on an excursion in Neerpelt to record surprising sounds. The result was a remarkable installation in an empty shop. Storyteller Joke Emmers found the inspiration for a musical and theatrical partnership with pianist and digeridoo player Johan Taens in the stories she heard locally. 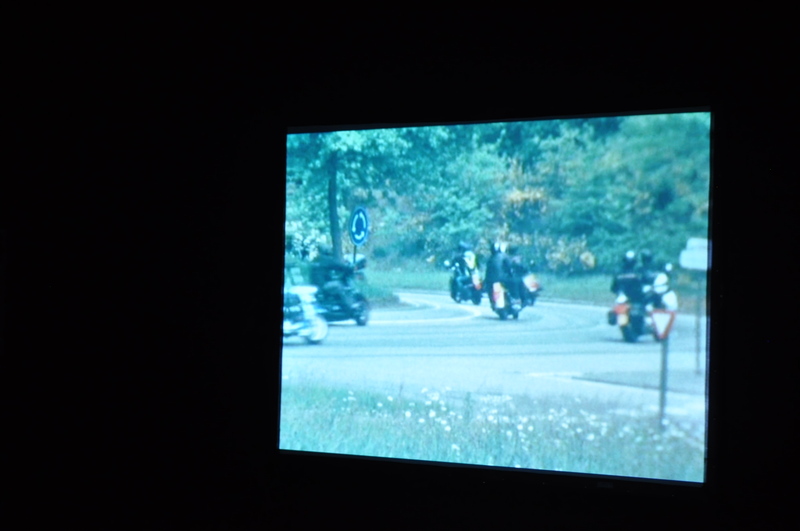 The streets of Neerpelt were also shown in a different light. Stijn Lauwers coached various classes at the art academy to create images of the village’s future (Postcards from the Future), based on old postcards and contemporary village life. 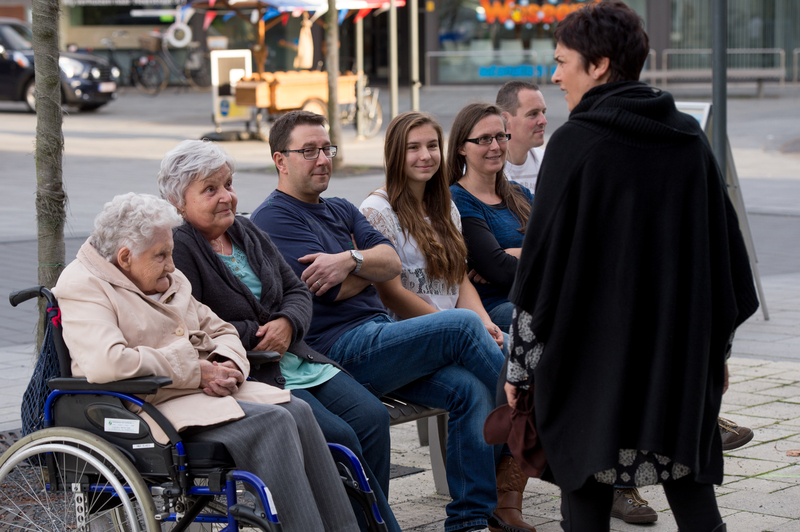 Listen here to Radio 2 Limburg’s report on ‘Joke Emmers vertelt’. The theme of Samhain 2014 was ‘memory and transformation’. What do people remember about the past? How have life and the surroundings changed? How will they continue to evolve in the future? 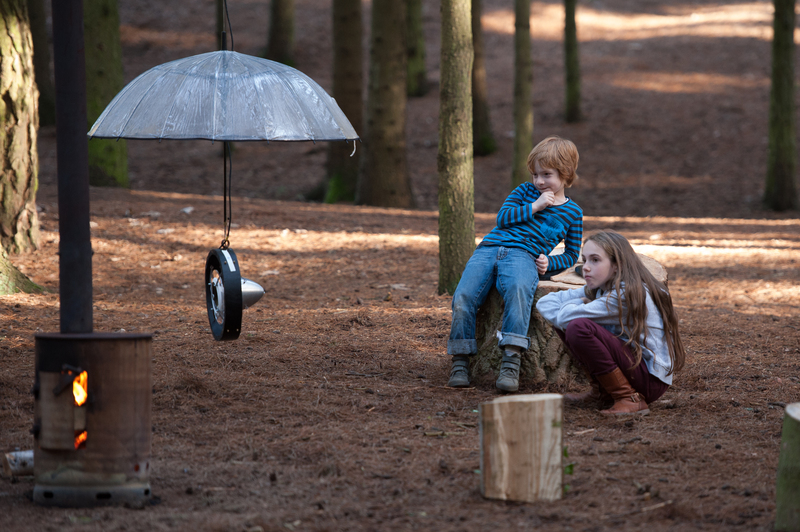 This theme also ran through the multidisciplinary evening productions in Dommelhof. On the Saturday evening, old or found image material was raked over to create new meanings in Cinéma Invisible (with Heleen Van Haegenborgh, Jasper Rigole and others) and the repetitive Congo Stamps by Simon Halsberge and Wiet Lengeler. 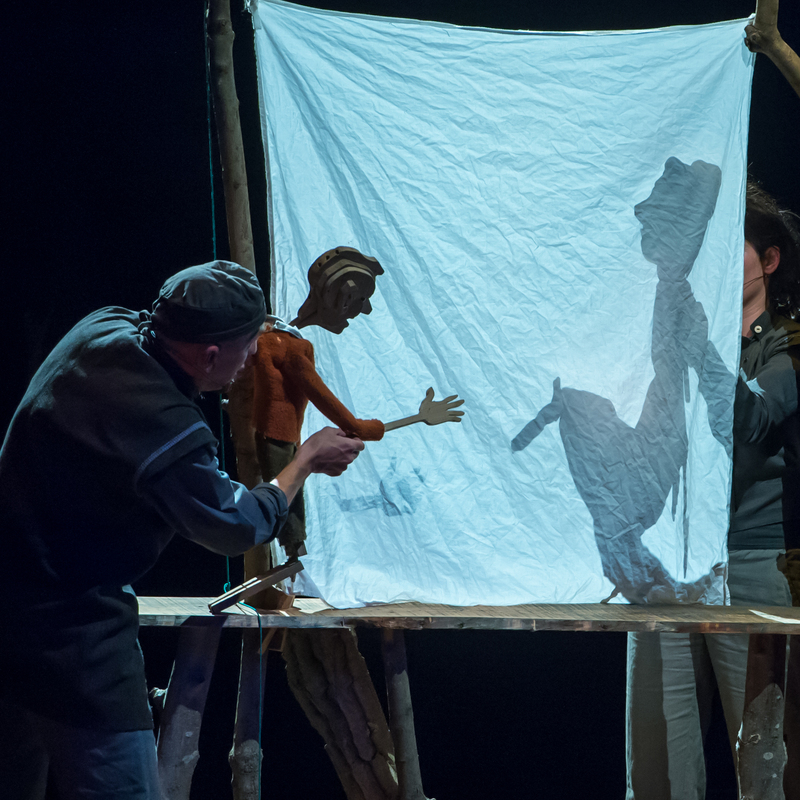 The previous evening, Elise Caluwaerts and Jurgen De bruyn from Zefiro Torna and the puppet theatre company Ultima Thule performed their show NERF on stage. This magic-realist production was all about human memory as well, and the impact it has on the present. The past and future give us a different perspective on the present. 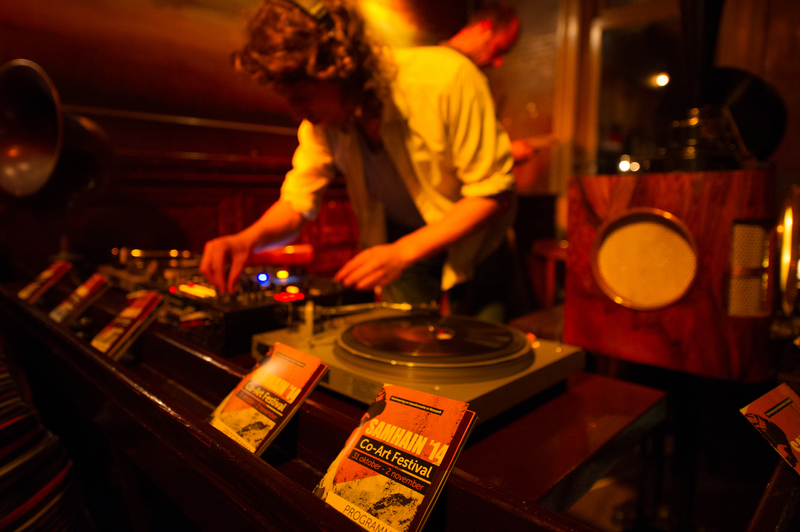 ‘Retro DJs’ Thomas Smetryns and Benjamin Dousselaere demonstrated exactly that in the pub ’t Vlaamsch Huis. With their78 rpm records and an old record player from the Radio Museum in Overpelt, they bathed the charming interior of the pub in nostalgia for two evenings running. Samhain ’14 – Co-Art Festival is a community art festival organized every two years by Musica and Dommelhof. 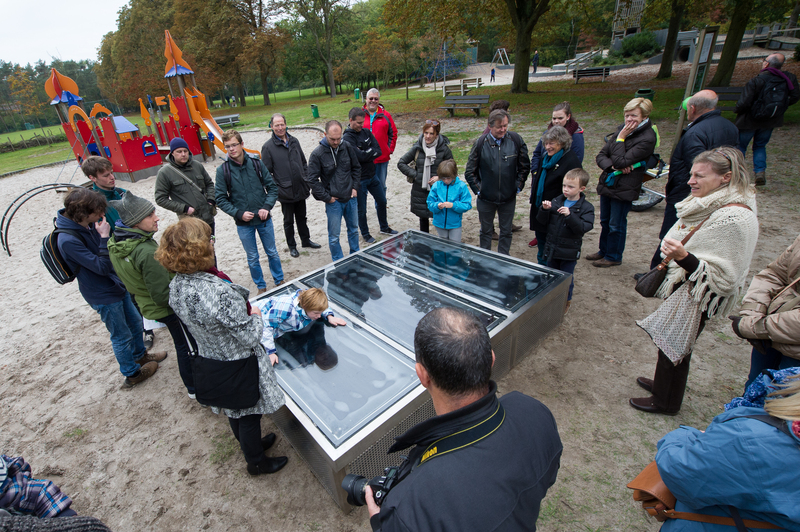 The festival was held from Friday 31st October until Sunday 2nd November 2014 at various locations in Neerpelt. The Laus Polyphoniae festival will be dedicated entirely to music copyist Petrus Alamire in 2015. 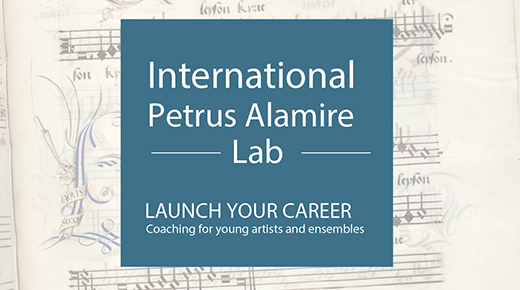 Especially for the occasion, the International Young Artist’s Presentation will be rechristened the International Petrus Alamire Lab. What meaning do the five hundred year-old manuscripts made by Alamire have for a 21st century audience? In what way can polyphonic Renaissance music be a source of inspiration for composers and musicians today, across styles and genres? Musica and AMUZ put out a call for promising musicians and ensembles to come up with original concepts as approaches to Alamire’s work. From the many, highly varied proposals, the jury consisting of Pascale De Groote (General Director of Artesis Plantijn University College in Antwerp), Frans de Ruiter (Director of the Academy of Creative and Performing Arts, Leiden University), Paul Craenen (Director of Musica), Herman Baeten (Chairman of Musica) and Bart Demuyt (Director of AMUZ), have selected five projects to embark upon a coaching process. The Swiss ensemble for mediaeval music RUMORUM will confront a historic approach with the use of historic synthesizers. The recorder quartet Boreas from Bremen will work with a light artist to bring the world of Petrus Alamire to life. The two sopranos, cornett, double bass and percussion that form the Belgian ensemble Circling the Spheres will improvise with Alamire’s fascinating work. They will approach this challenge armed with considerable experience in jazz, early and contemporary music. Victoria Bernath will also improvise, but as a soloist, tackling one of the works from the Petrus Alamire choirbook held in Britain. She will also draw inspiration from this specific style of motet for her own compositions. Finally, the two young musicians in the ensemble Two Envelopes will present a daring concept for harpsichord, the sounds of writing and electronics. These different projects will be developed over the coming months, mentored by specialists including Eric Sleichim and Raquel Andueza. 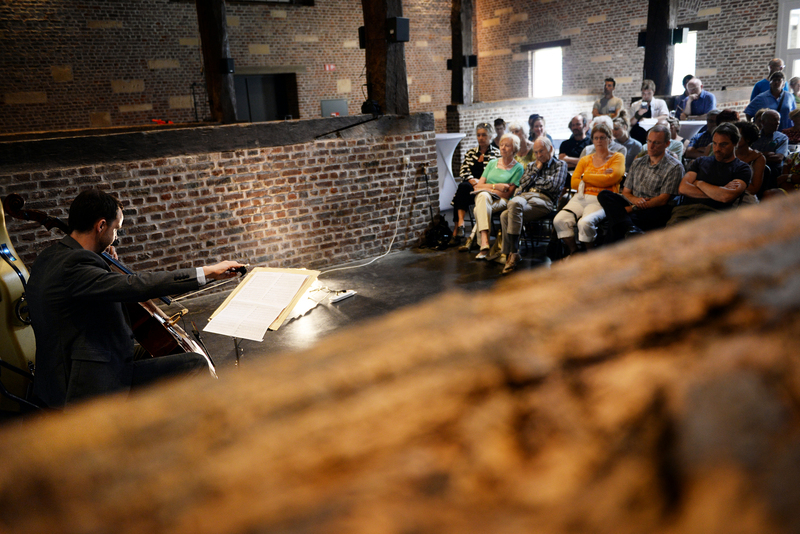 Initial coaching will be held at AlbaNova (28 June, Alden Biesen; www.albanovafestival.com), with a presentation of the projects and discussion of the conceptual approach. 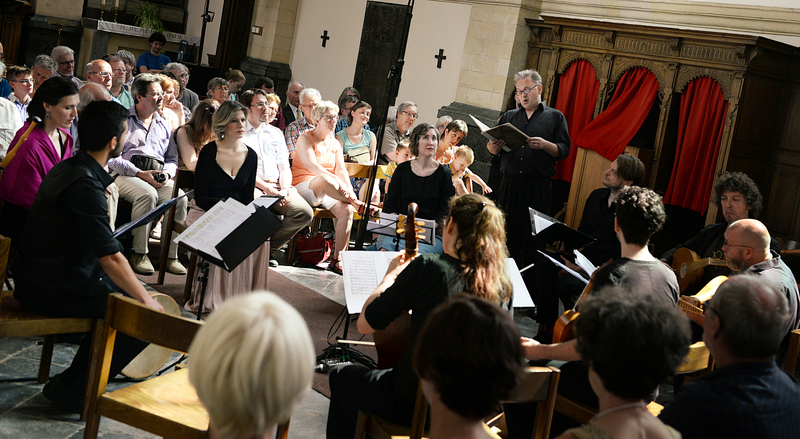 An intensive, three-day musical coaching session is programmed for the early music festival Laus Polyphoniae, at which the ensembles will also present their work to the general public. The ensembles will then also have the opportunity to introduce themselves to international concert organisers (including a delegation from the REMA). The networking session and the support of Musica and AMUZ will subsequently help them to continue extending their international careers. Could we dream up a work of art for the finale to the Unie Hasselt-Genk that would make the two cities resound in harmony, with as many participants as possible from different sections of the population? 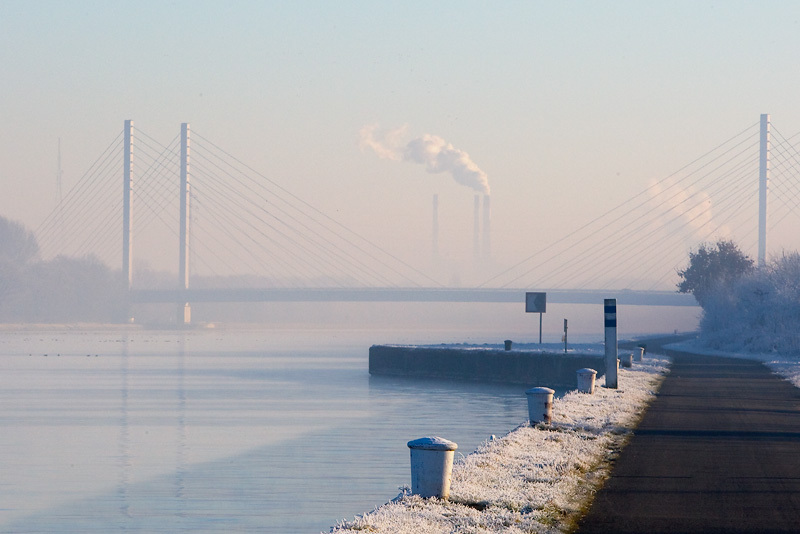 Could we think of a way to create some kind of ‘sound wave’ between Hasselt and Genk, ideally along the Albert Canal and the oversized bridge to nowhere, the Tuikabelbrug? The curator of the Unie Hasselt-Genk, Tom Van Gestel, imagined something huge, inspired by a historical music spectacle from the Soviet era, featuring artillery, choirs, orchestras and a whole fleet of ships. We immediately thought of other historical examples that embodied the idea of ‘two in one.’ Take Giovanni Gabrieli’s ‘cori spezatti’, for example, two choirs positioned far apart in Saint Mark’s Basilica in Venice just under five hundred years ago, a set-up which created a stereo sound in the imposing space by means of alternating, antiphonal singing techniques. Or the father of American composer Charles Ives, who instructed two marching bands to march towards each other from opposite directions, each playing their own tune. The collisions of sounds in and out of tune were enough to give the young Charles Ives a lifetime’s worth inspiration for the disconcerting compositions that later made him famous. Before long we came up with the idea of uniting the two poles of Hasselt and Genk with two walls of sound that would move from the two cities towards the Tuikabelbrug, where they would merge into a two-part whole. We realised the effect would be even greater if the sounds of Genk and Hasselt respectively led a life of their own beforehand: if the sounds could nestle inside the heads of the people of Genk and Hasselt at the start of the Unie and then unite resoundingly during the finale. A concept for The Sound of Hasselt and Genk was born. It soon became clear that there were many obstacles along our path from dream to reality (including a canal and a bridge). How could we get local groups enthusiastic about such an ambitious, and above all highly adventurous, artistic project? How realistic was it to create two sound waves moving towards each other? How could something like this be done in the open air with musical instruments that needed to stay dry? And above all: who would be able to shape these ideas artistically? We took our concept to Wim Henderickx, a composer with an international career but more than anything someone we trust, who has already proved his ability to spark enthusiasm in large groups of people, even with music that does not immediately appeal. Wim was persuaded and we took him to the place where everything was going to happen. We stood on the bridge and let our imaginations loose. The size of the bridge and the canal made an impression, but what struck us most was how the wind blew all the sounds away. A sobering sound test along the hunting path revealed that besides protection from the wind, amplification would be essential. The scale of the project gradually began to dawn on us. Working groups got down to the business of sorting out logistics, production and communications. Plans were drawn up, tested and fine-tuned. After a general call for participants, representatives of no less than forty local musical groups and ensembles turned up to the first info session. They were often hesitant, and many had questions. Was it going to be difficult? Would they need a lot of rehearsals? Wim unveiled the plan with infectious enthusiasm. 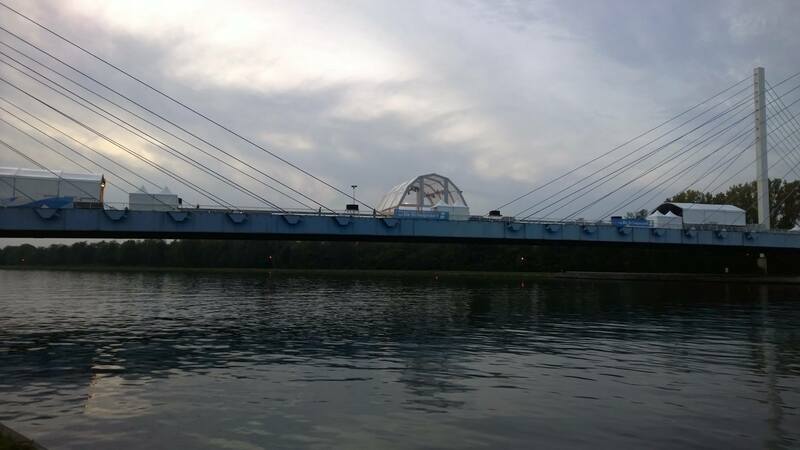 By now the concept had evolved into a ‘living sound sculpture’ that would be performed on three stages on the bridge: a symphony orchestra, a brass band and, in the middle, a large choir with two soloists and percussion. Antifoon was to become a composition with a clear structure, but also a lot of freedom for everyone, from beginners to advanced musicians, to do their thing. 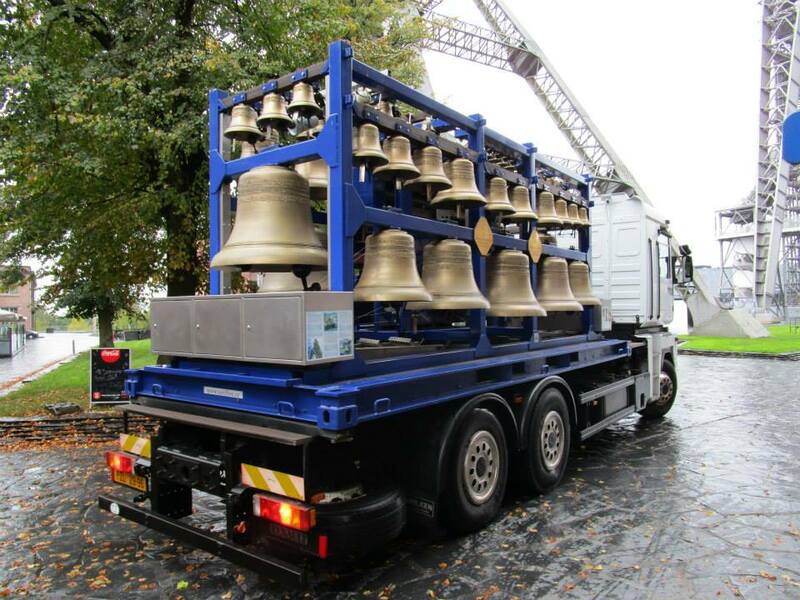 The premiere would be preceded by parades from Genk and Hasselt with mobile sound makers. Wim would also compose two city tunes for Genk and Hasselt that would be heard at the end of the composition and which would be played beforehand by the carilloners and street musicians all summer long. 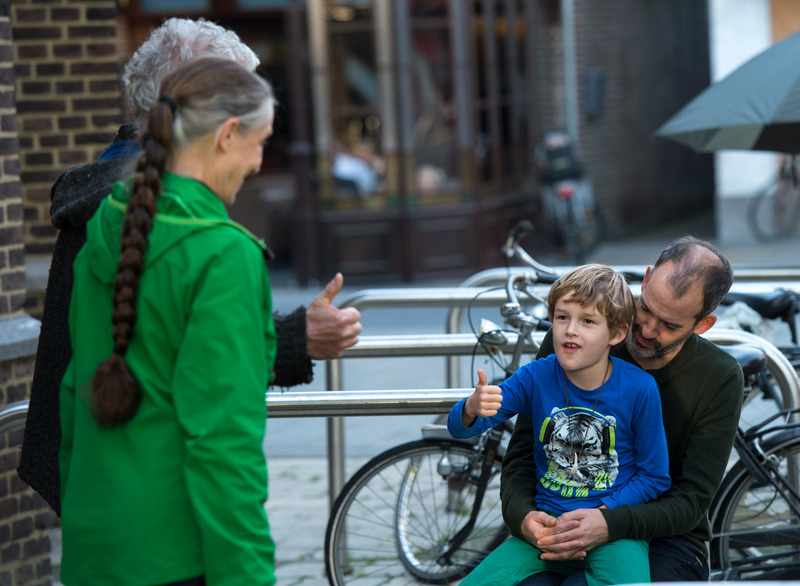 Enthusiasm grew, and by a few months before the premiere we could count on participants from eight choirs, four brass bands, the Limburg symphony orchestra ‘Jeugd en Muziek’ and several percussion groups. When Hasselt conservatory and Genk music school jumped on the bandwagon a little later with large groups of young singers and percussionists, we realised we had an unexpected problem: we had more participants than anticipated, more than we could deal with, and many of them needed a place on the bridge that was protected from the rain. We puzzled over the figures, but it was becoming increasingly clear that the logistical and technical side of the project were becoming an enormous challenge. Yves Mergaerts from Kick came to the rescue. He came up with a transparent cover with space underneath for more than 200 singers, and also dealt with the sound amplification in a three-part system that did justice to the musical concept. On 5th October, on the stroke of four, The Sound began with a cannon shot. Immediately, sirens began to blare in the distance and fire engines began to drive slowly towards the bridge from opposite directions. Behind them came platoons of singing bicycles and honking Vespas, as two fleets of pleasure boats sailed towards each other down the canal itself. Under the Tuikabelbrug, two alpenhorns were waiting for them, one on each side of the canal. They made the metal of the bridge sizzle with musical question-and-answers. Up on the bridge, a parade of children playing PVC instruments wound their way between the crowds of people. Gradually the various orchestras began to join in with short bursts of sound. 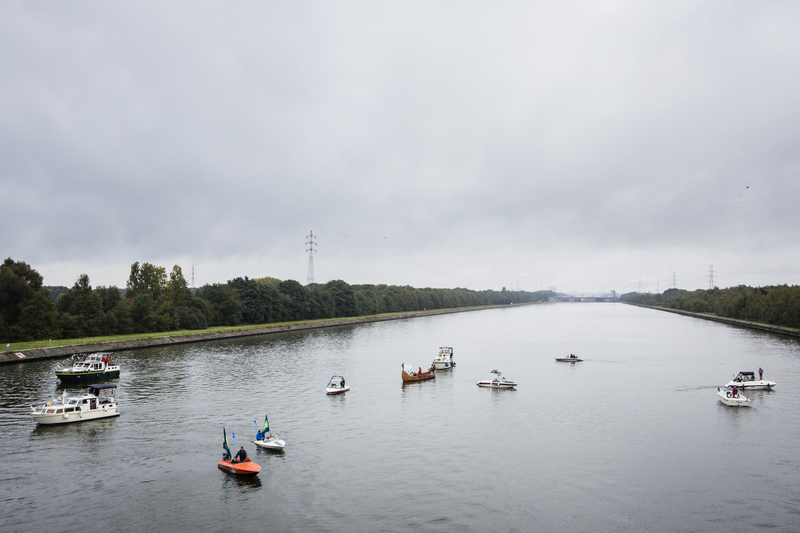 In the distance, trucks carrying the percussion groups led by Luc Mishalle and Jo Zanders approached the bridge along the hunting paths, followed by two mobile carillons playing the Genk and Hasselt city tunes. A final burst of cannon fire close to the bridge was the starting signal for Antifoon, Wim Henderickx’ brand new composition. Musical energies and colours came and went in quick succession: colourful orchestral sounds were interrupted by the percussion groups. Pulsing passages were followed by long drawn-out, harmonious waves of sound. The music flowed back and forth over the bridge, from one stage to another. Around five hundred musicians gave of their best for more than half an hour, fired up by three conductors: Pieter Schuermans for the symphony orchestra, Diederik Glorieux for the choir and Kevin Houben for the brass band. In the middle of the bridge, Wim Henderickx oversaw the entire show from a kind of command centre. Towards the end of the performance, two soloists appeared on the central stage. Coloratura soprano Elise Caluwaerts and bass Werner Van Mechelen took the musical symbolism to its apex, bringing Antifoon to a long, lyrical close. When the applause died down, the city tunes sounded out for one last time, now in a powerful up-tempo version. Then the musicians and audience made their way home, and quiet returned to the Tuikabelbrug. 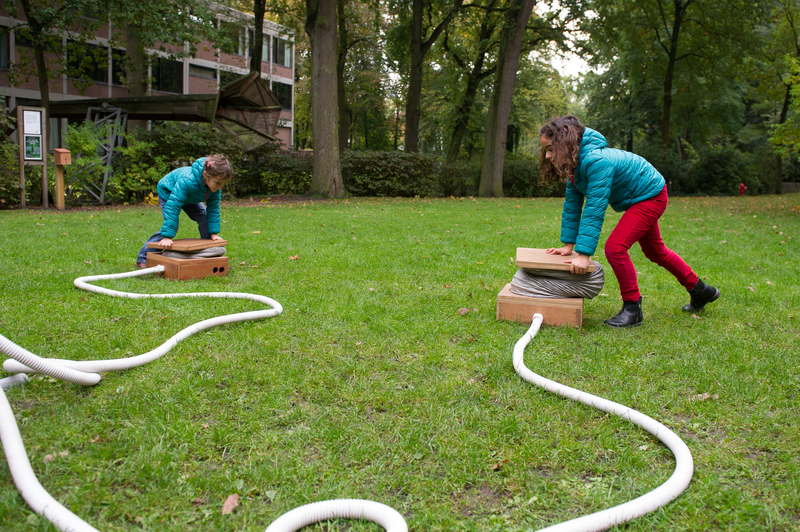 On 15 October 2013, Musica (Neerpelt), Z33 (Hasselt) and C-Mine Cultural Centre (Genk) sent out a call for young sound artists to engage with ‘the sound’ of Hasselt and Genk. Out of more than 40 entries from Belgium and abroad, jury members Paul Craenen (Musica), Esther Venrooy (School of Arts Gent), Gilles Helsen (Musica), Tim Toubac (Z33) and Ils Huygens (Z33) chose six promising sound artists: five from Belgium and one from the Netherlands. Canvas followed their artistic process closely and made a documentary about the project. 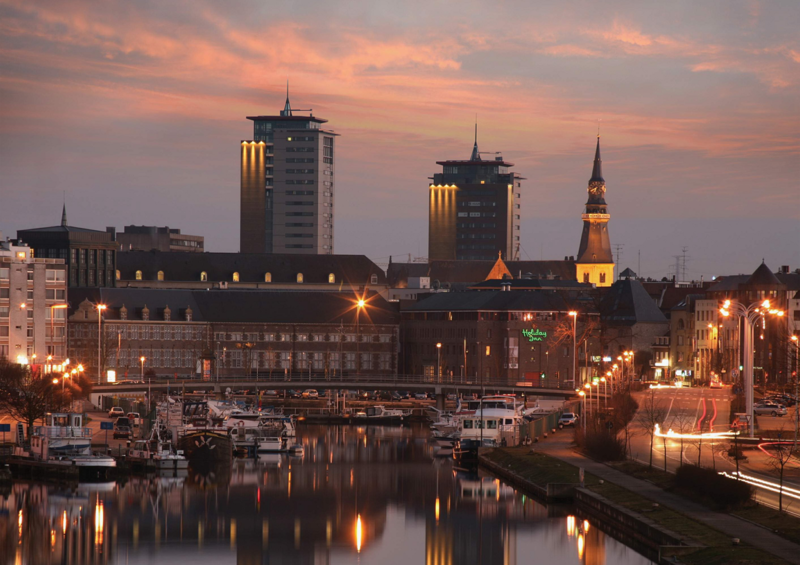 Hasselt and Genk: a new metropolis in Limburg? Hasselt and Genk, the two biggest cities in Limburg, are only a stone’s throw apart. In recent decades, moreover, they have been growing closer and closer together. So it is not unthinkable that in the future the two cities might merge into a single commercial and cultural metropolis. This immediately raises questions about how we might shape the open spaces between Hasselt and Genk. And above all: how should we imagine this future metropolis? After all, Hasselt and Genk have completely different characters: the picturesque shopping city of Hasselt with its traditional jenever drink and the cathedral, and the open industrial city of Genk with its recent mining history still fresh in people’s memories. You don’t just see the differences and similarities between the two cities: you can hear them as well. Each of the cities has its own, unique urban soundscape, a typical landscape of sounds that determines the character of the surroundings. 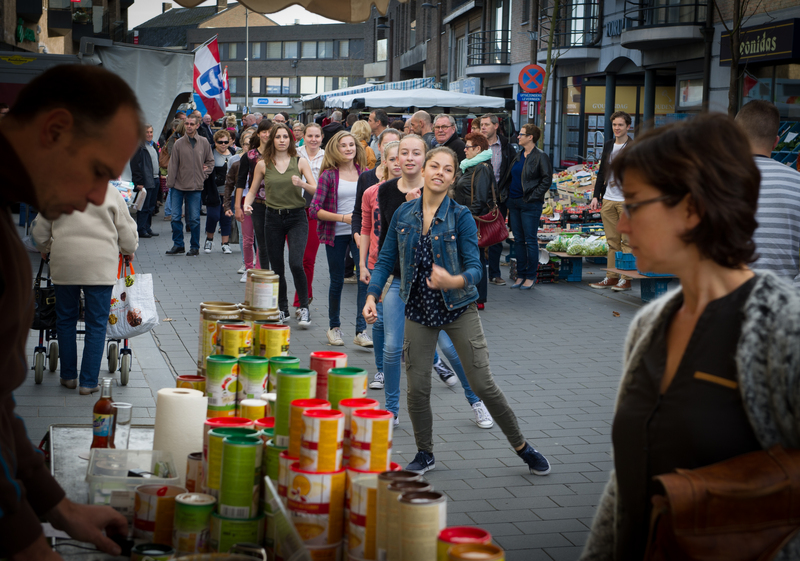 Hasselt sounds different to Genk: you are more likely to hear high heels ringing on cobblestones in Hasselt than in Genk, where, however, there is a far greater variety of dialects and languages to be heard. For Atelier de Stad Hasselt-Genk the six selected artists went in search of this acoustic identity. They set off into the cities, together or alone, armed with their ears, microphones and above all a healthy dose of imagination and creativity. 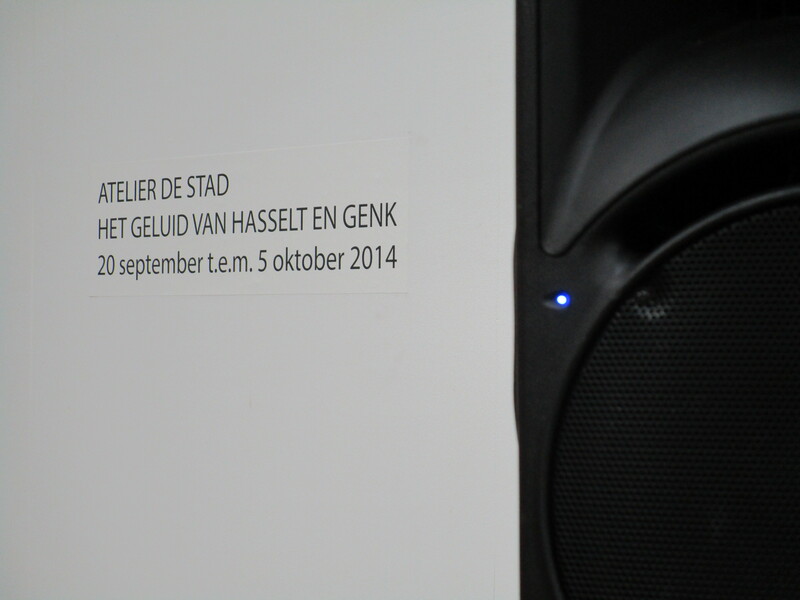 Would they be able to imagine a situation where sounds from Hasselt and Genk combined to create something new? Atelier de Stad Hasselt-Genk is one of the five ‘city workshops’ revealed this autumn on Canvas, along with Brussels, Ghent, Kortrijk and Ostend. The film crews followed the entire artistic process from the selection procedure in February 2014 to the opening of the exhibition in C-Mine Cultural Centre in September this year, where the results were presented. 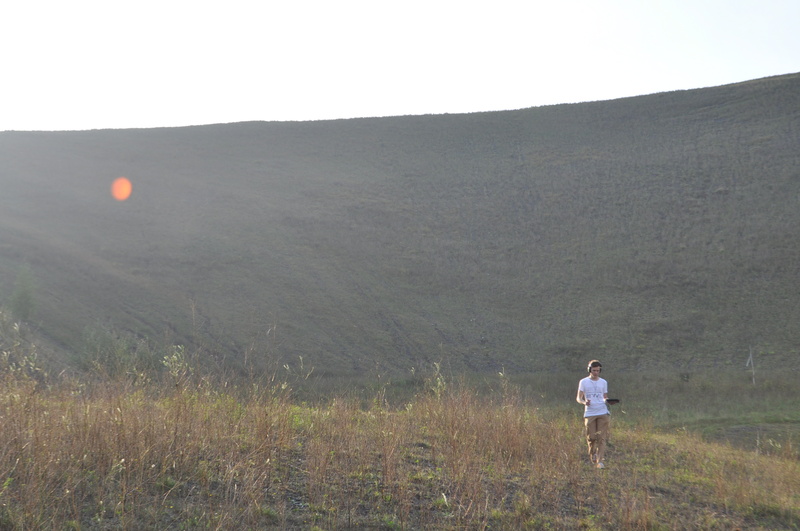 In an initial phase, the six artists went on study trips in the field. Simon Halsberghe and Caroline Claus took a bicycle ride together through the extensive urban zones that can be found all over the region: past houses built for miners, housing estates and industrial estates, along the canal, discovering the old mine sites and the nineteenth-century terraced houses. 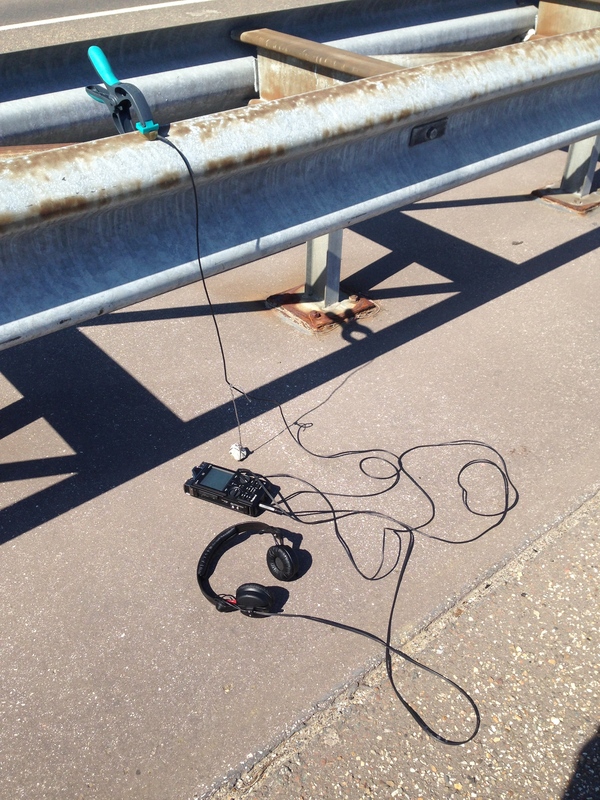 Simon Halsberghe made field recordings with contact microphones on safety railings or trees. The mayor of Genk allowed Caroline Claus to see the ambitious energy plans that are currently on the drawing board. 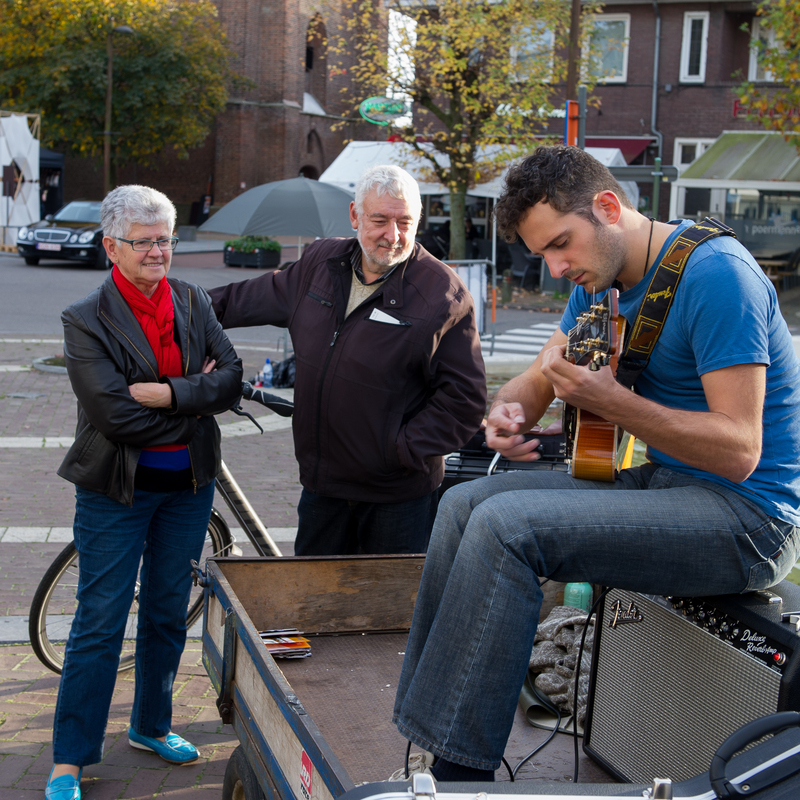 Tim Finoulst took his electric guitar into the centre of Hasselt to play traffic signs and sculptures with the help of transducers: he literally uses the city as an ‘amplifier’ for his guitar improvisations. As the only Limburg native among the artists, he knows the region better than anyone. 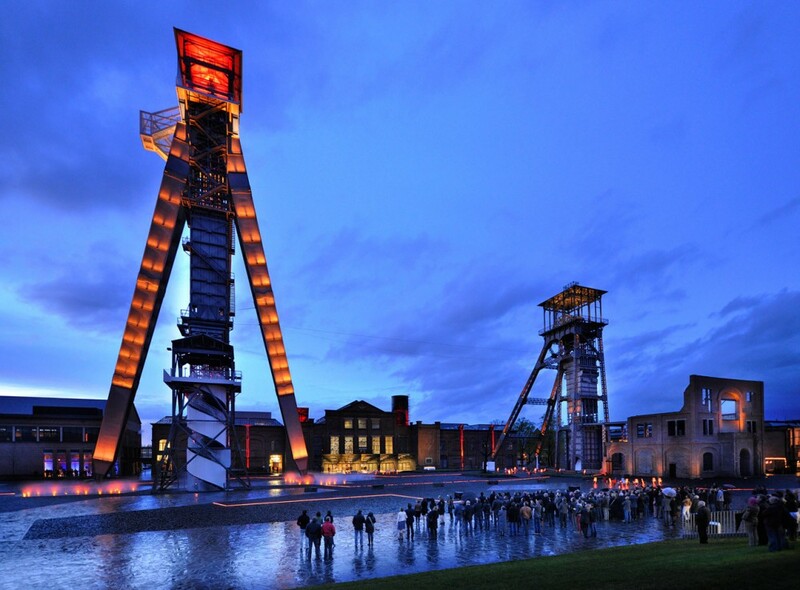 Marieke van de Ven (NL) visited the Emile van Dorenmuseum in Genk and took a walk through the fascinating landscape around C-Mine to immerse herself in the transformations the landscape has undergone. The local dialects provided the subject for Koenraad Vandersyppe’s investigations. He developed an artificial language in which elements of both Hasselt and Genk dialect can be discerned. 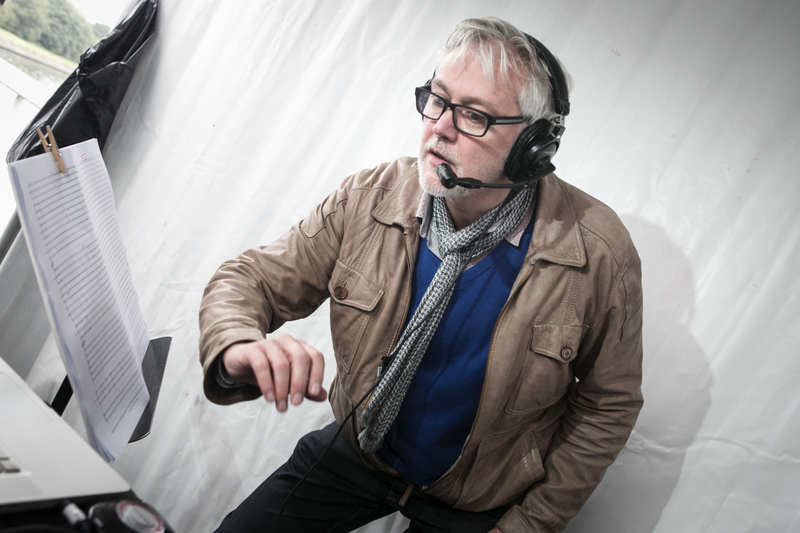 Finally, Joris Gielen combed the streets of Hasselt and Genk in search of typical sounds and unusual acoustics. 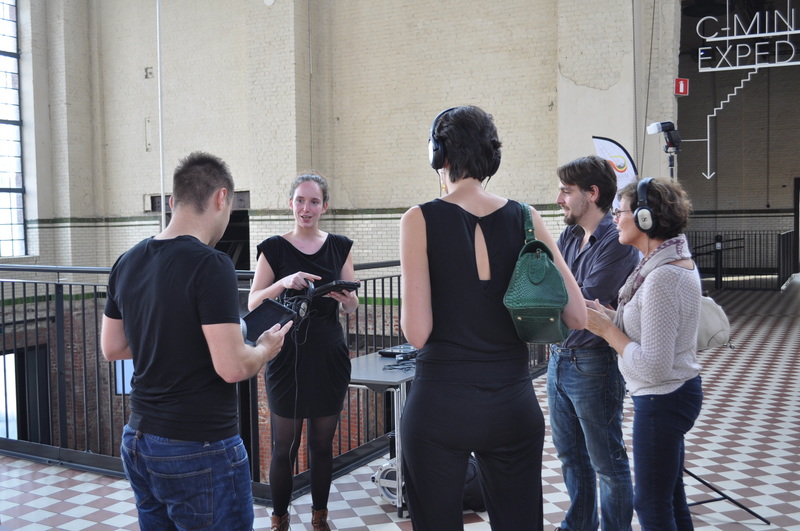 Musica, in partnership with sound artist Esther Venrooy, coached the artistic processes right from the start. In July, the group was invited to a working residence in Klankenbos (Neerpelt). From here the sound artists, most of whom do not live in Limburg, could explore the region and work on their creations in peace. Musica also made its Klankatlas platform and tools available for the project: Marieke van de Ven used the mobile GPS application that Musica developed with Yvan vander Sanden for the Maasland Sound Route to create her poetic listening walk for the C-Mine spoil tip; likewise, the Klankatlas interactive map provided the medium for Joris Gielen’s sound map. Download Marieke van de Ven’s mobile app entitled Songs for a Landscape from the Klankatlas. 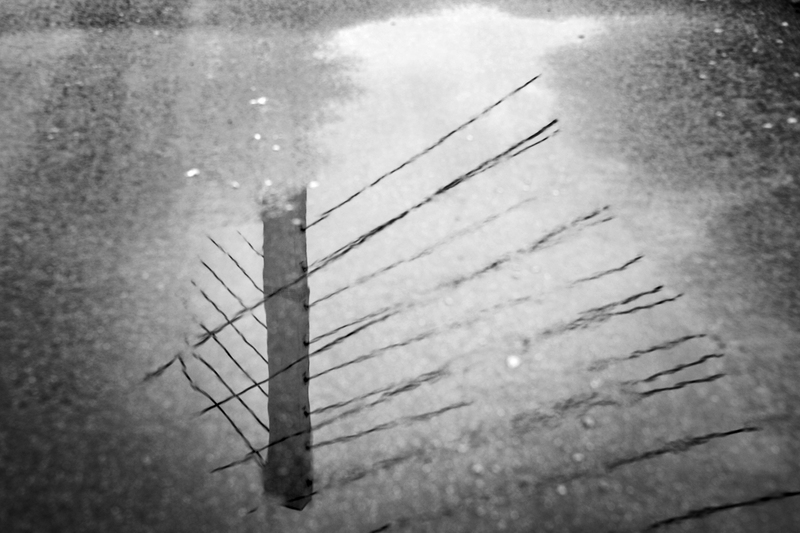 Listen to Joris Gielen’s soundscapes in the Klankatlas. On 20 September 2014, the results resounded through the industrial spaces of C-Mine, where the enormous, rusty machines make the history of mining feel very tangibly present. 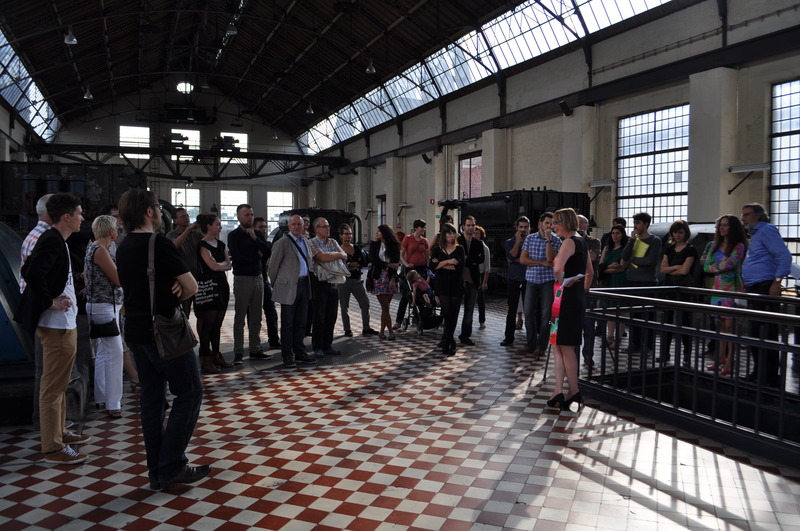 The techniques and media that the Atelier de Stad artists used to translate their work were highly varied: until 5 October, the public were not only able to experience a listening walk with a mobile app or discover an online sound map, but also to enjoy a performance by Tim Finoulst, an audiovisual installation by Simon Halsberghe and a publication by Caroline Claus. 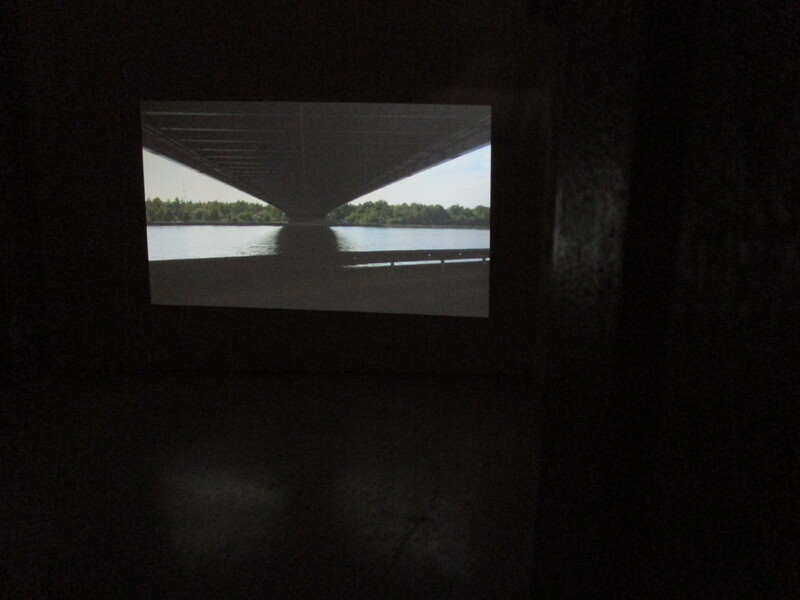 A video projection showed an installation by Koenraad Vandersyppe that was not at the C-Mine site but a few kilometres away, beneath the cable-stayed bridge over the Albert Canal between Hasselt and Genk. 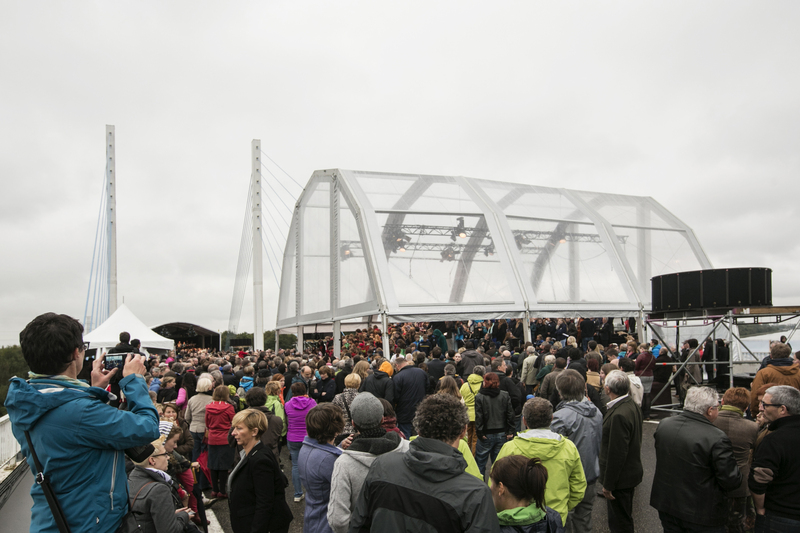 This is a symbolic place where the finale of the Unie Hasselt-Genk was held on Sunday 5 October in the form of The sound of Hasselt and Genk and the premiere of Antifoon, a living sound sculpture by Wim Henderickx for more than 400 musicians.